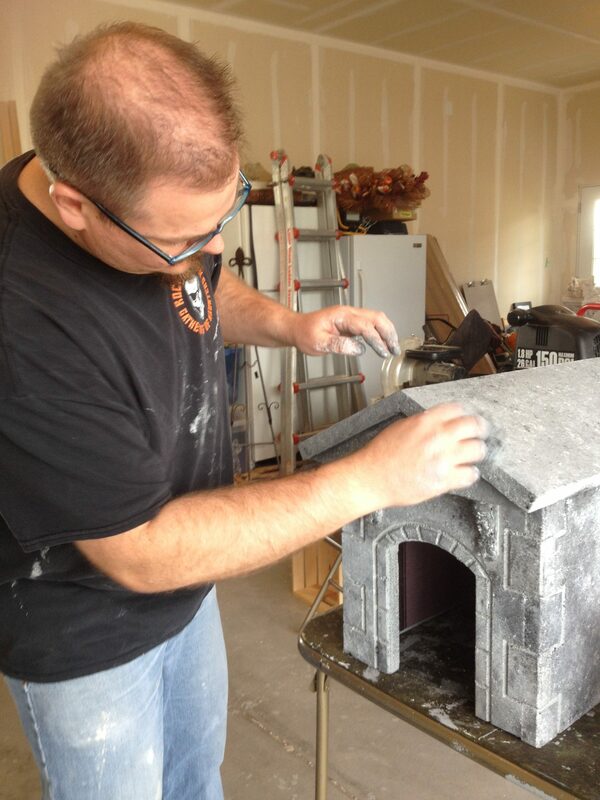 2016 was a great year for prop building at The Never Moor. 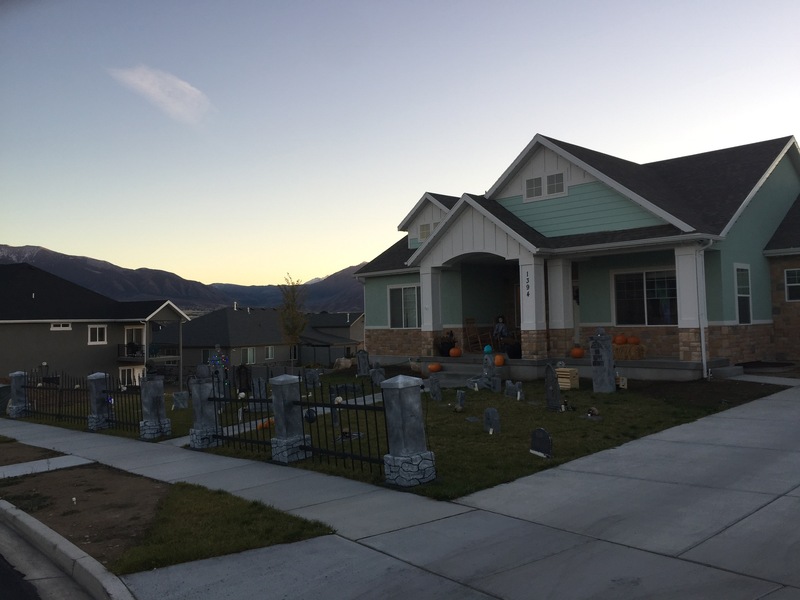 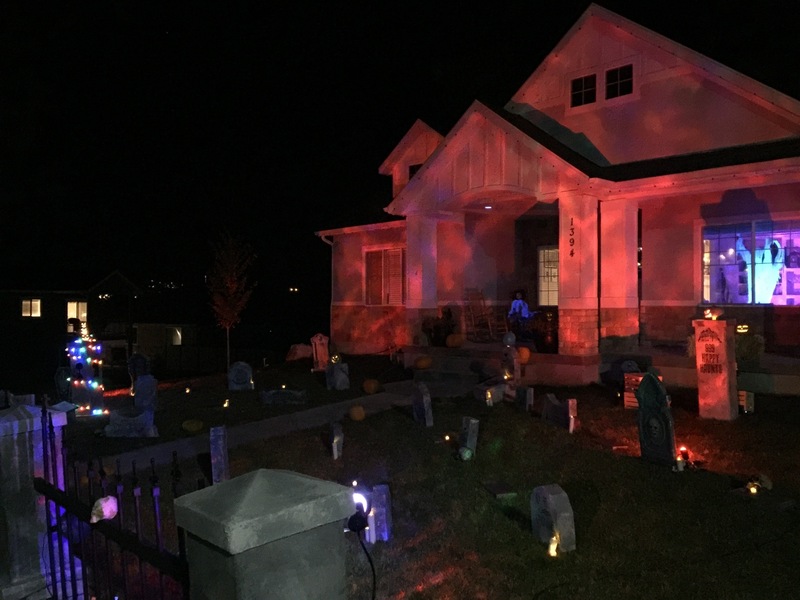 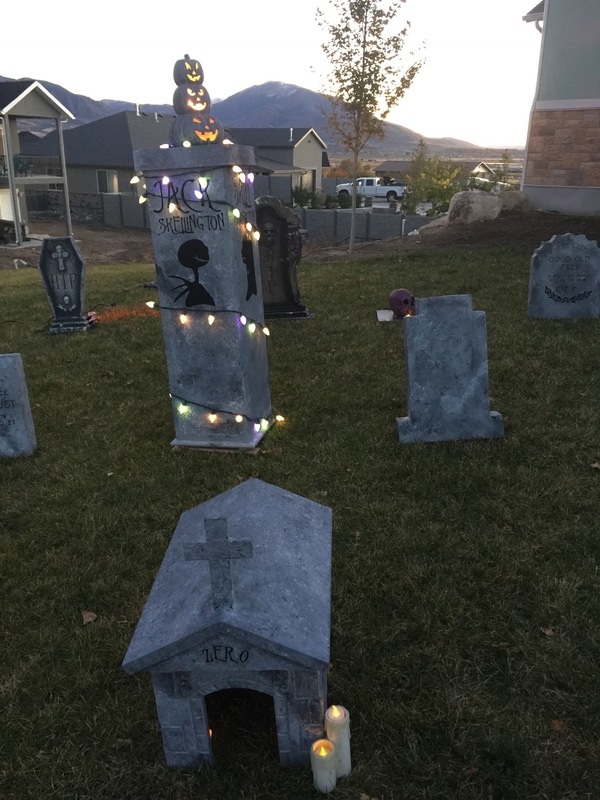 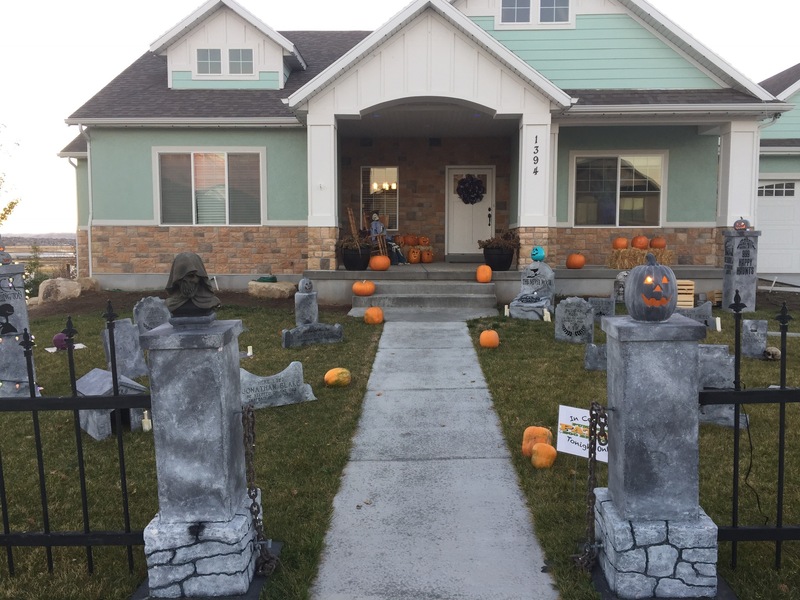 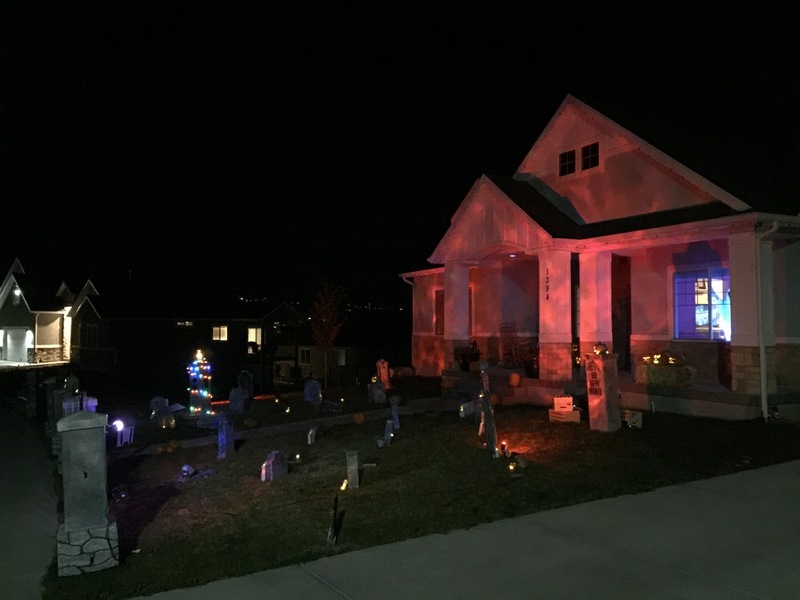 This year we focused on adding more tombstones to our graveyard since our new home’s yard is three times the size of our old yard. 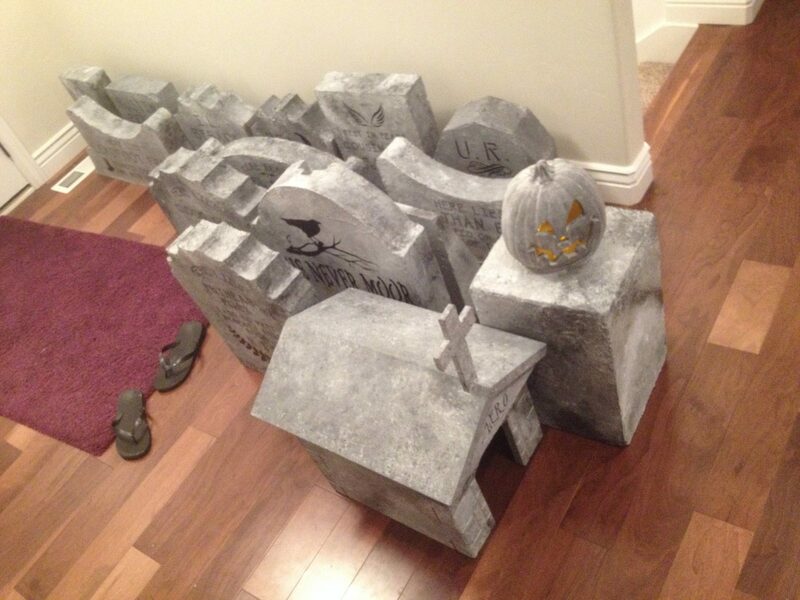 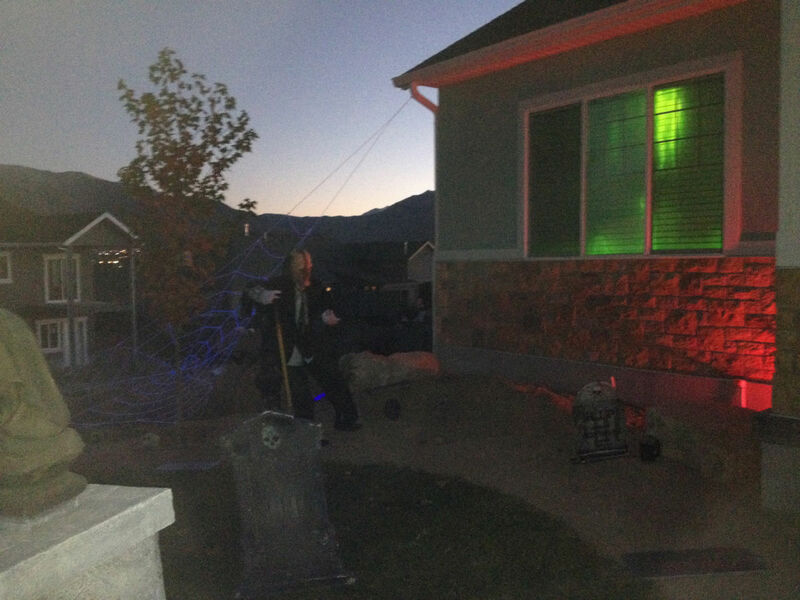 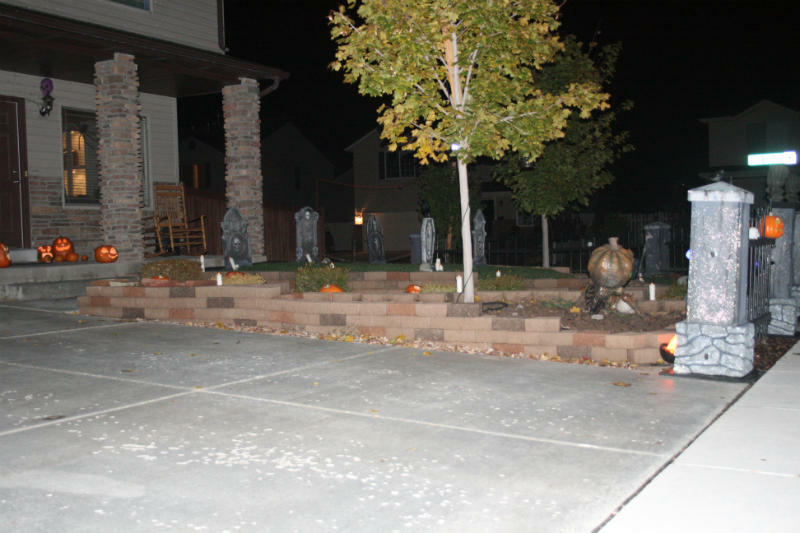 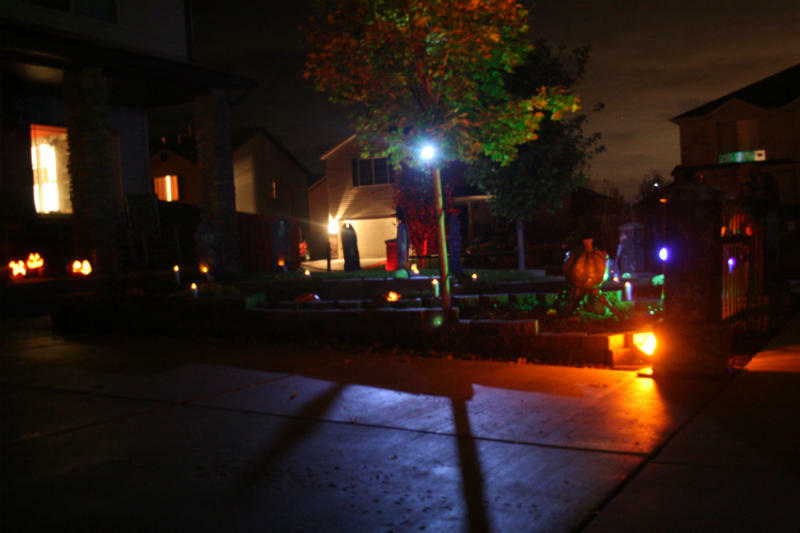 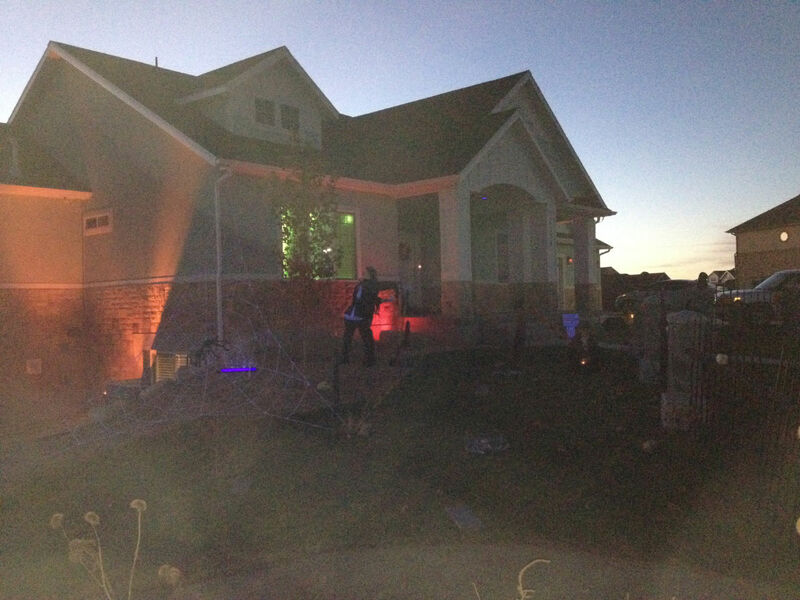 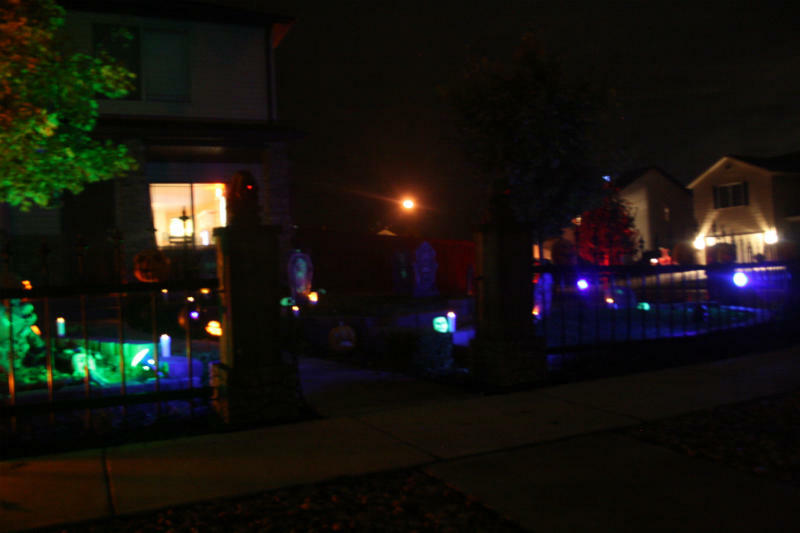 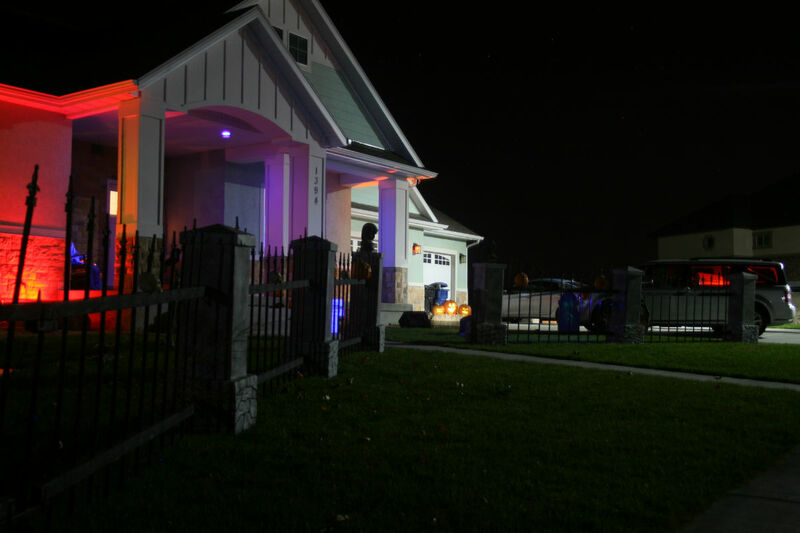 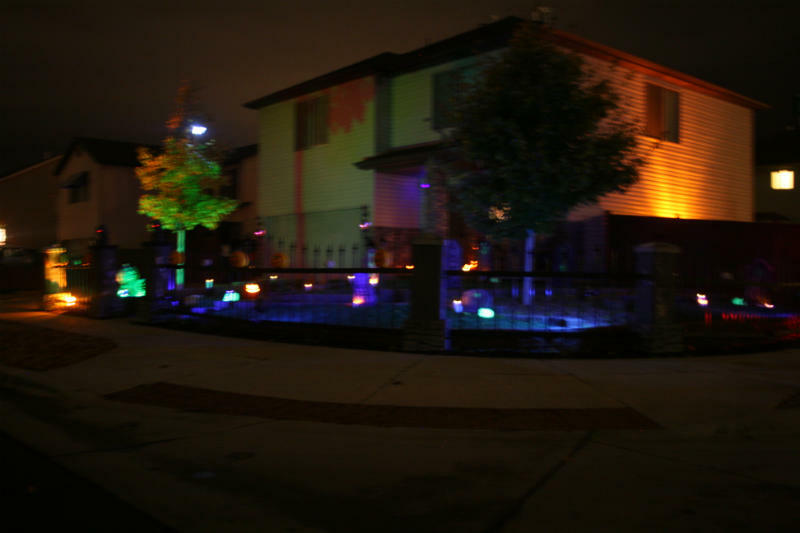 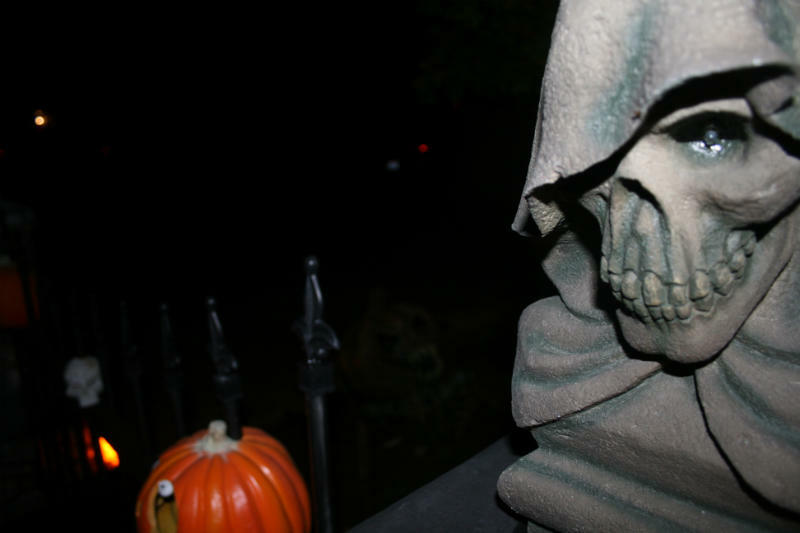 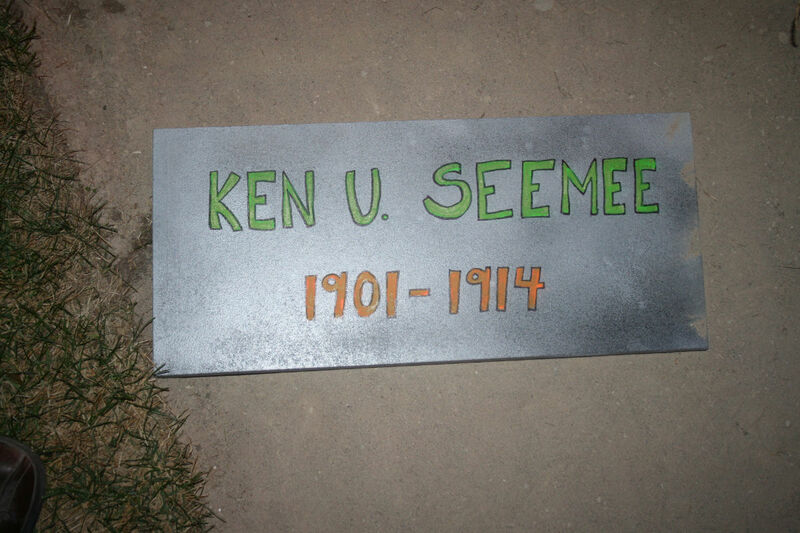 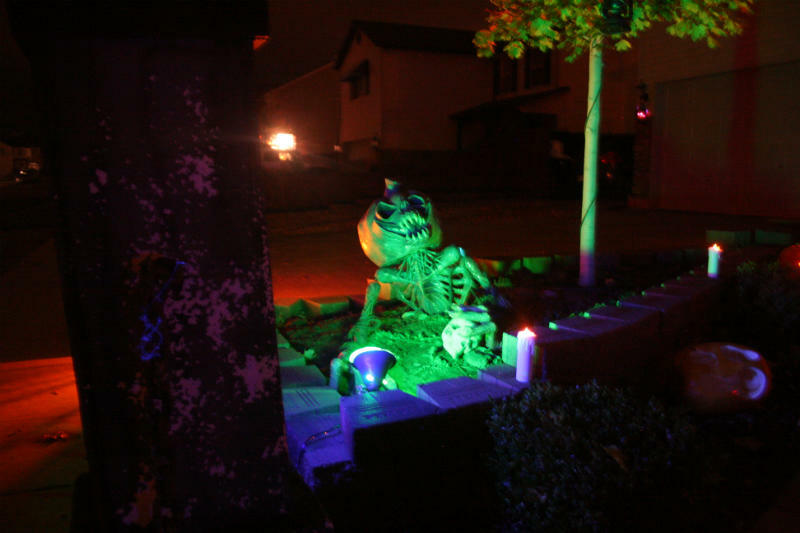 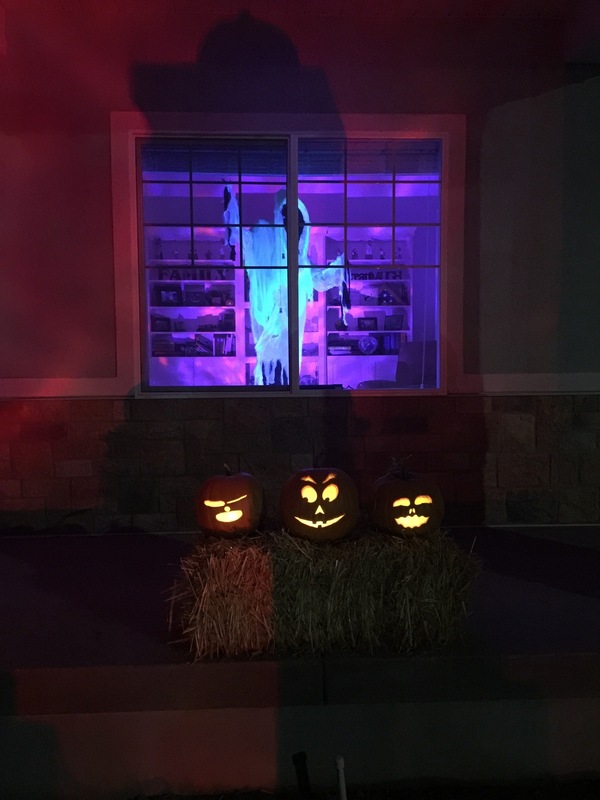 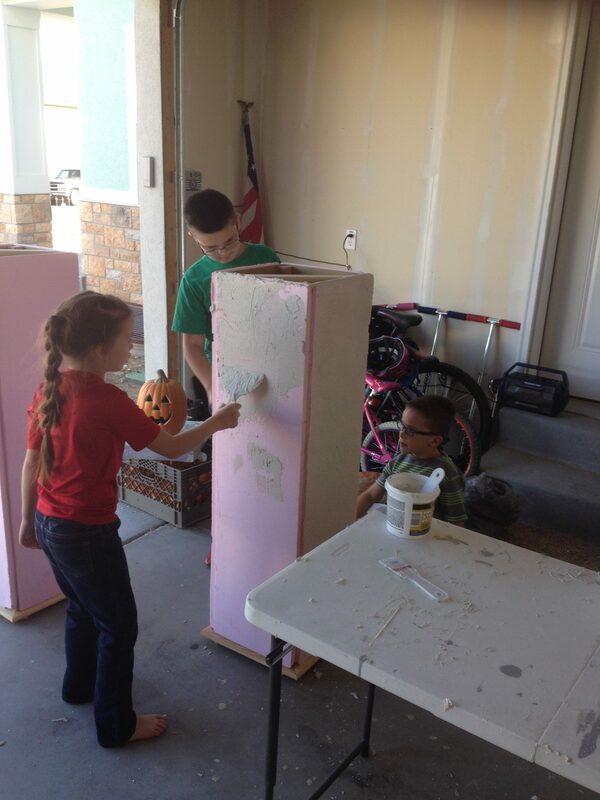 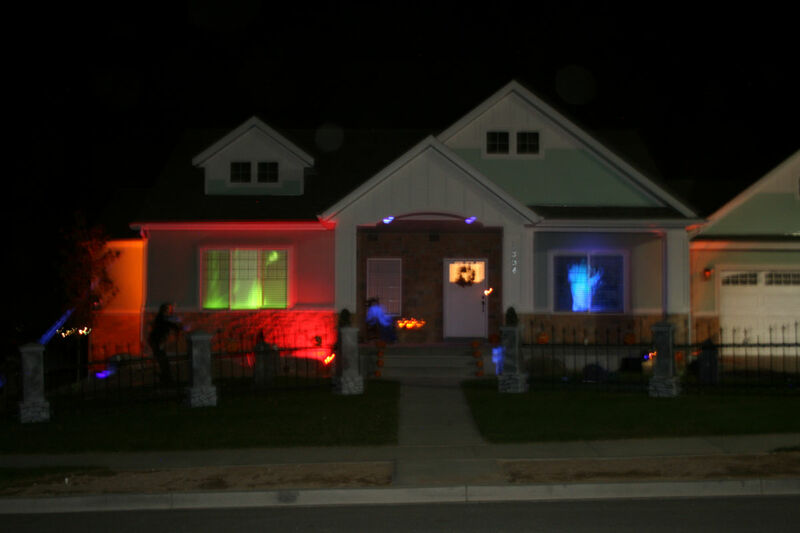 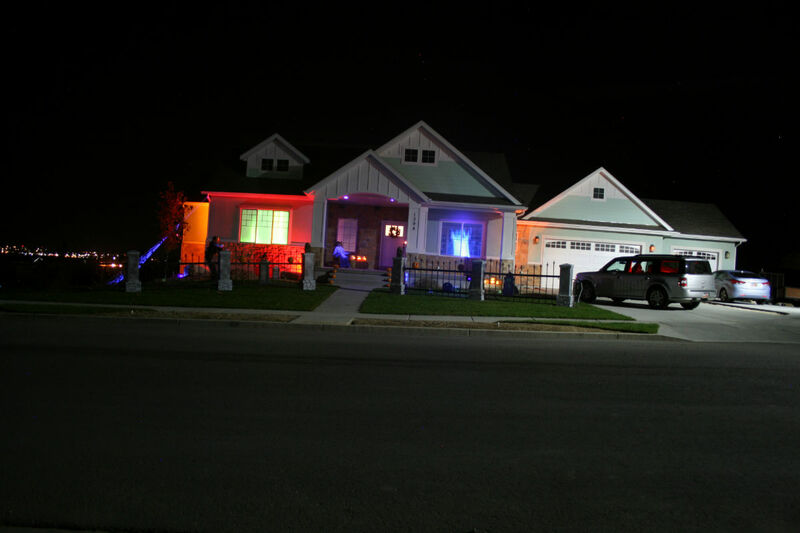 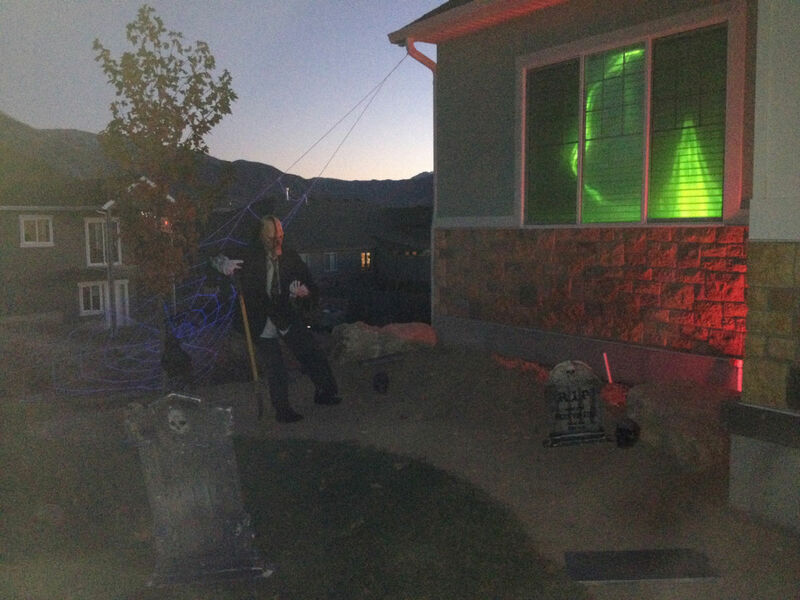 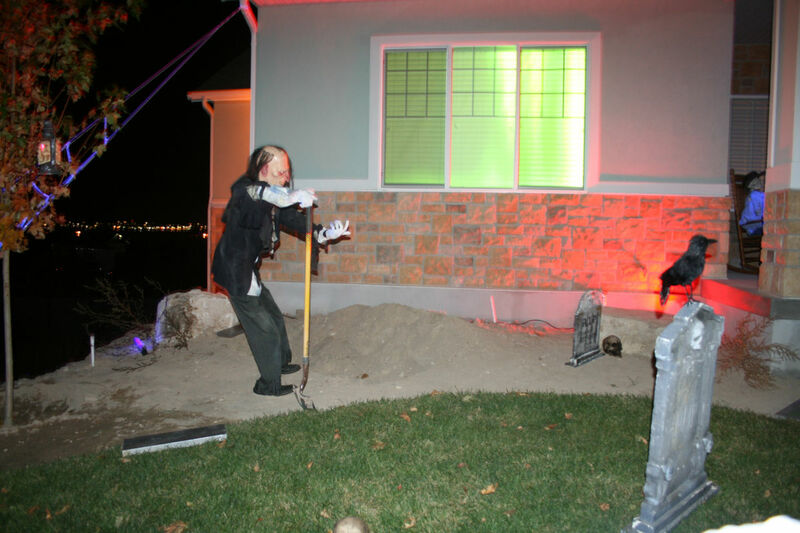 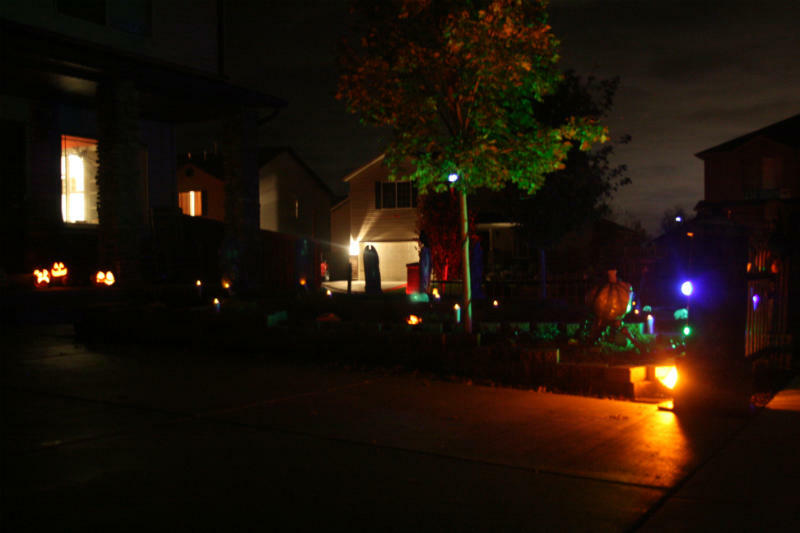 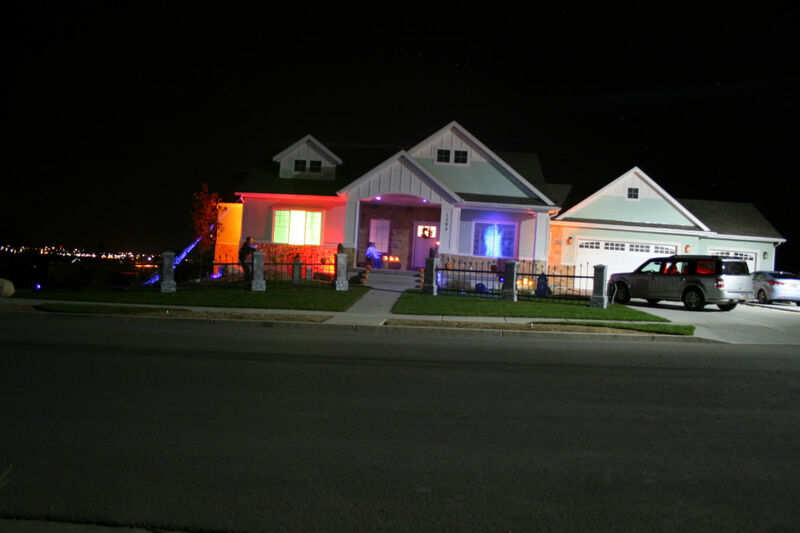 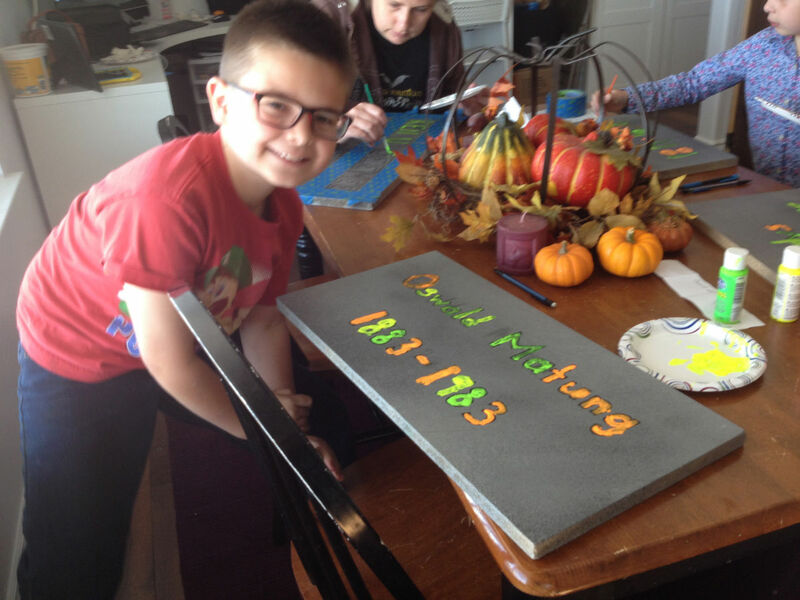 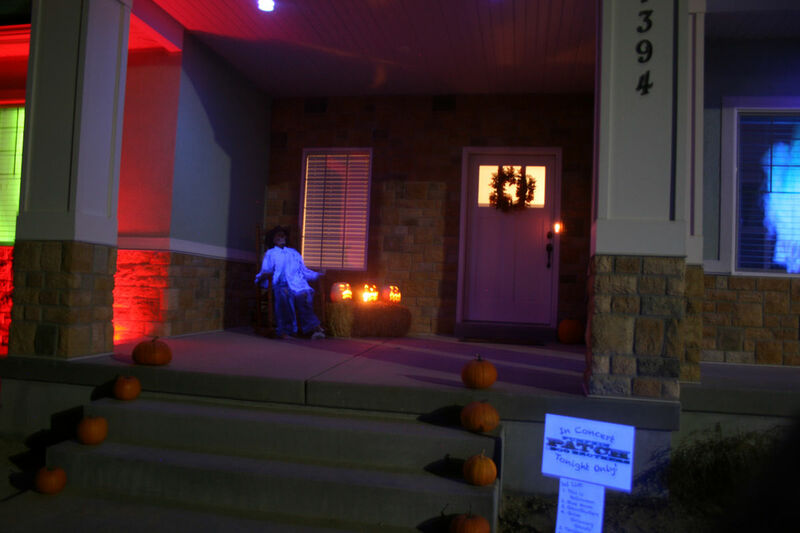 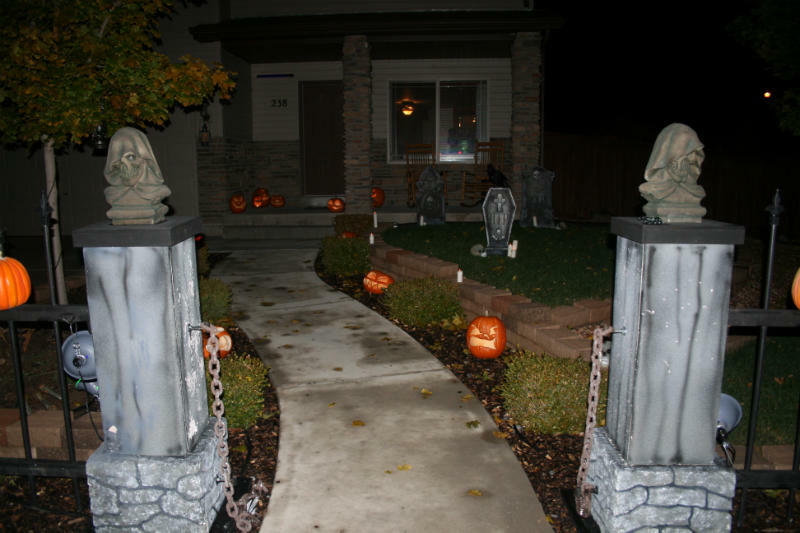 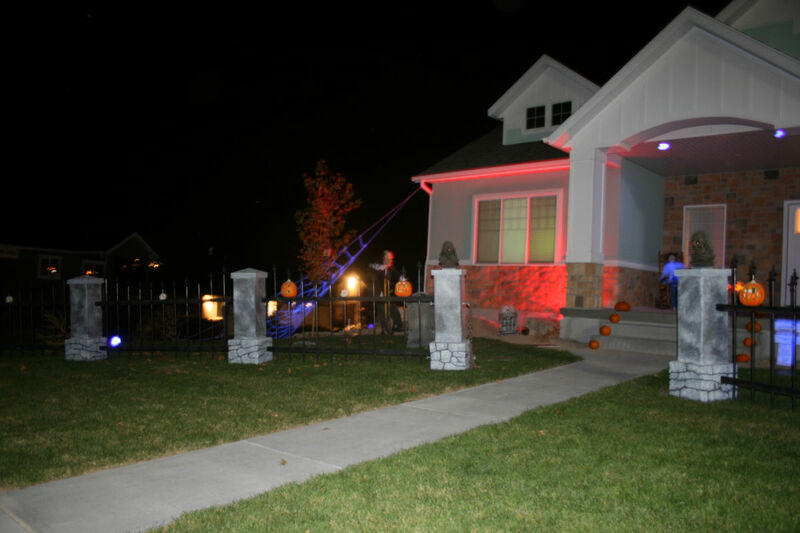 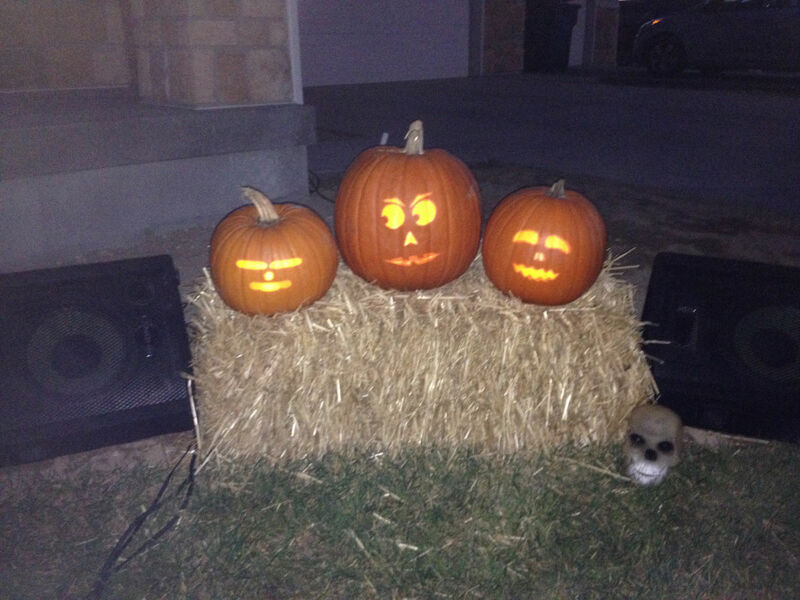 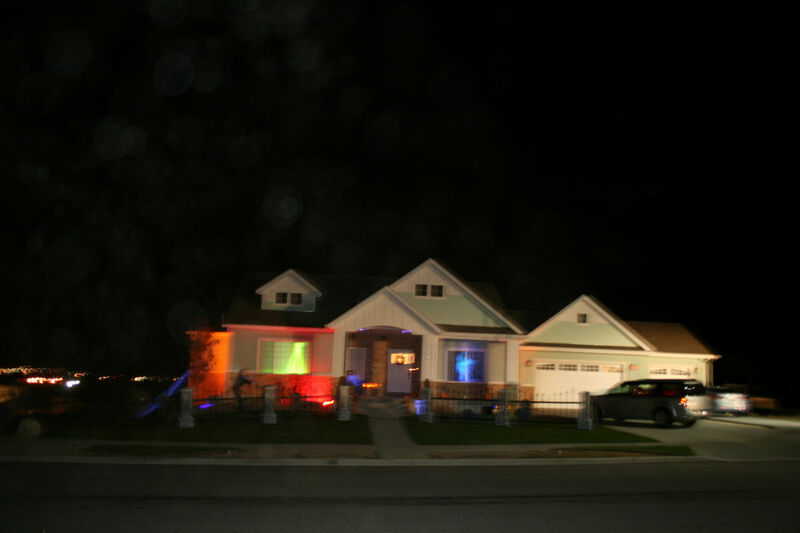 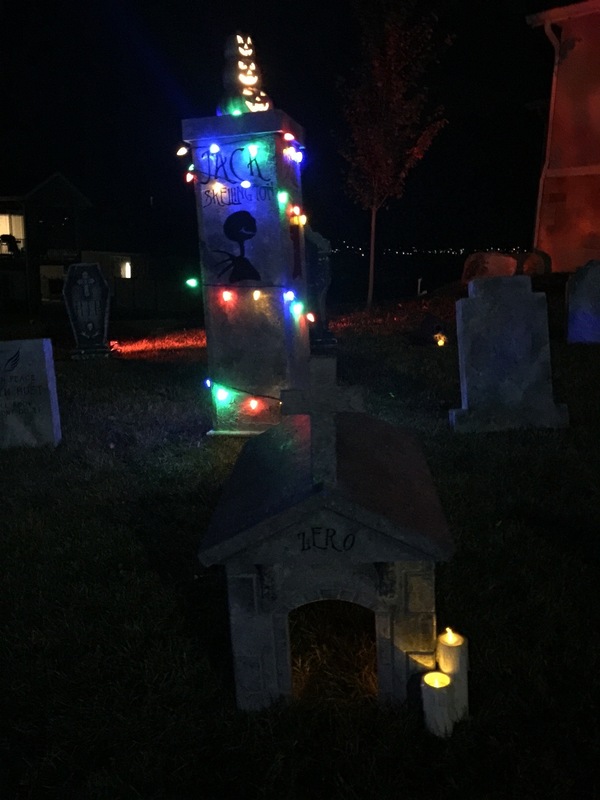 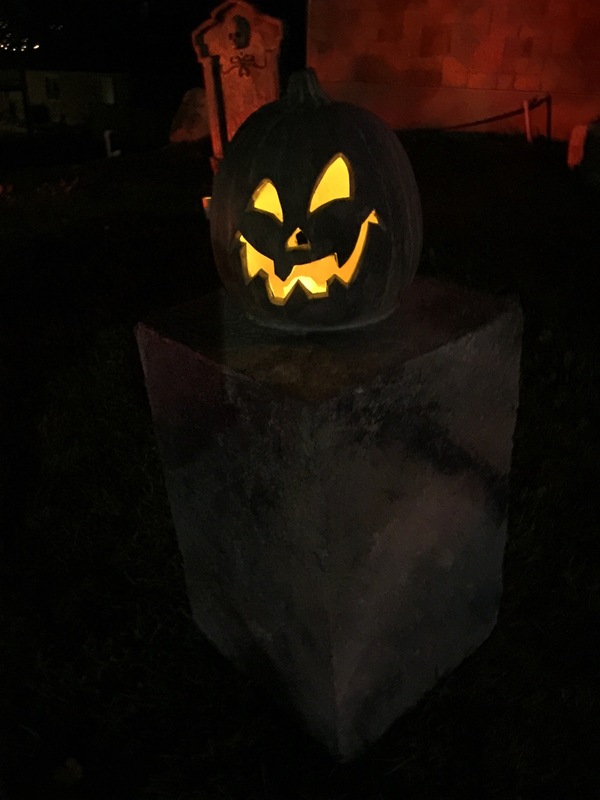 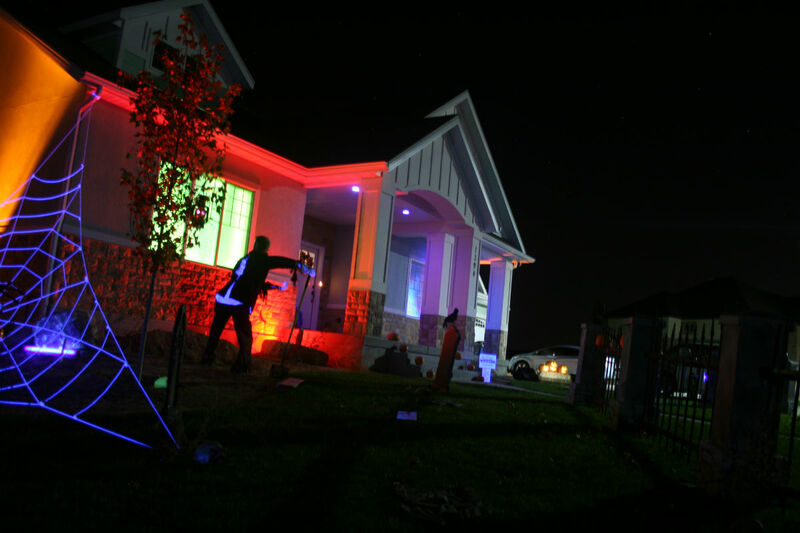 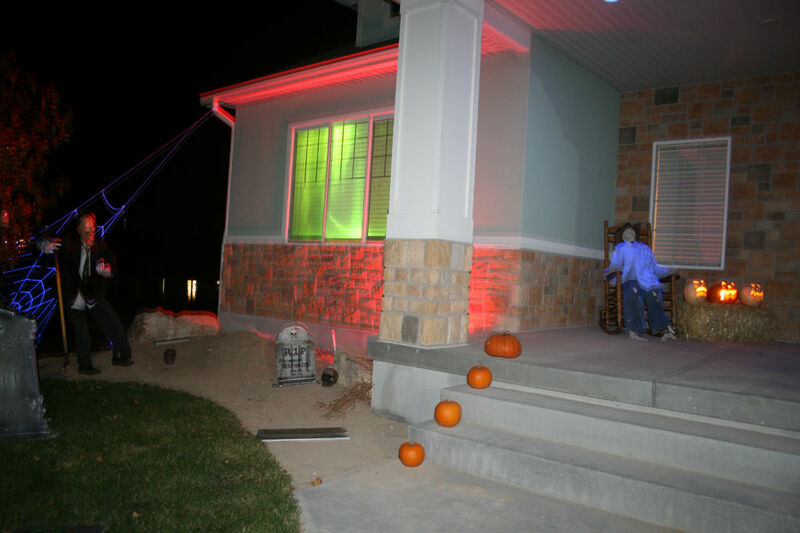 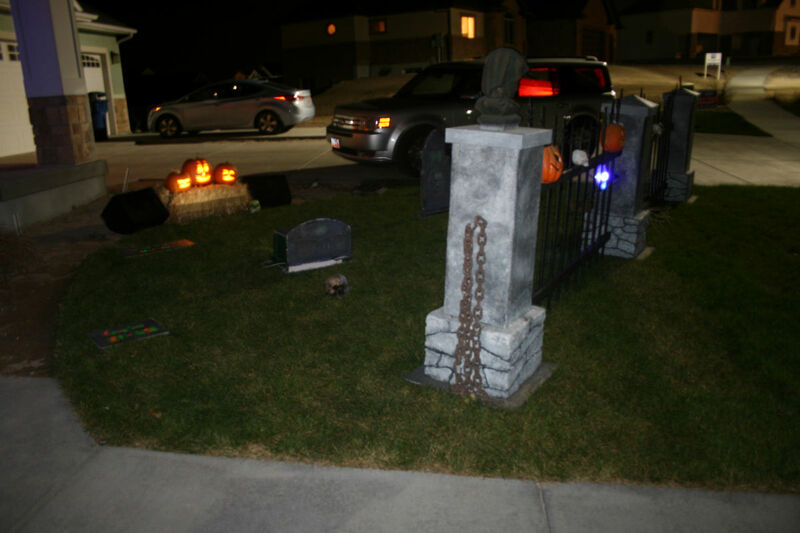 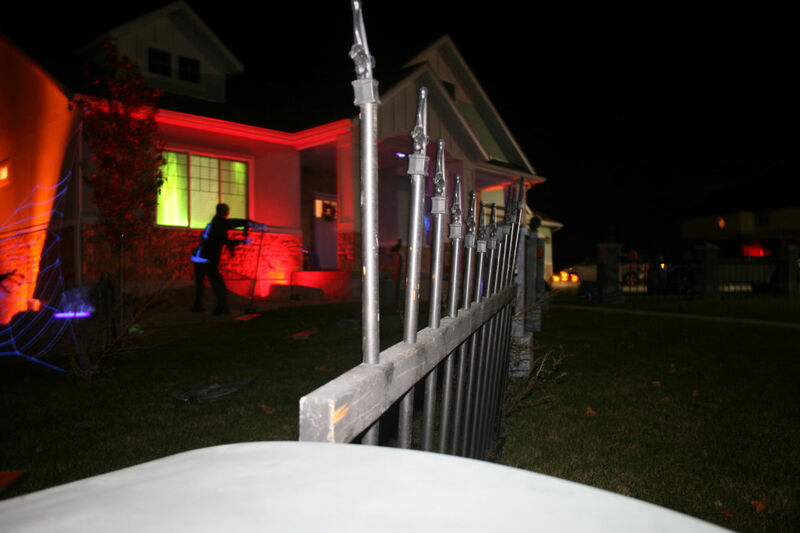 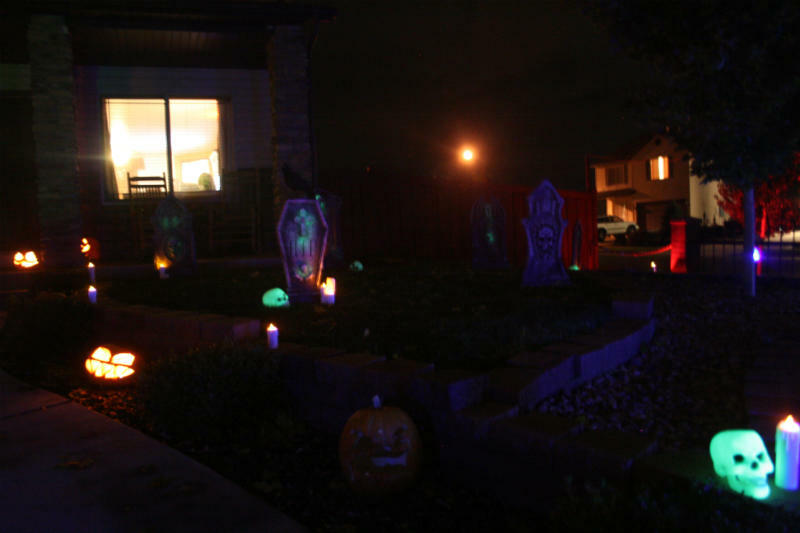 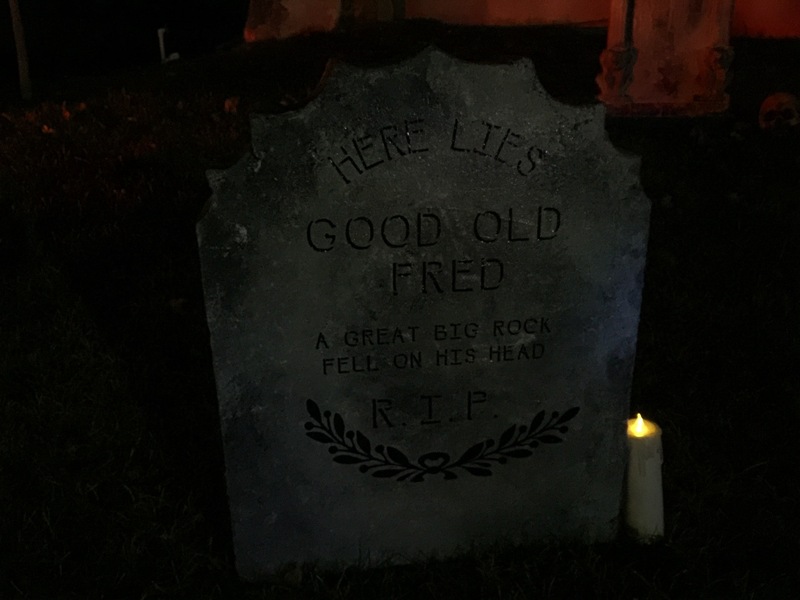 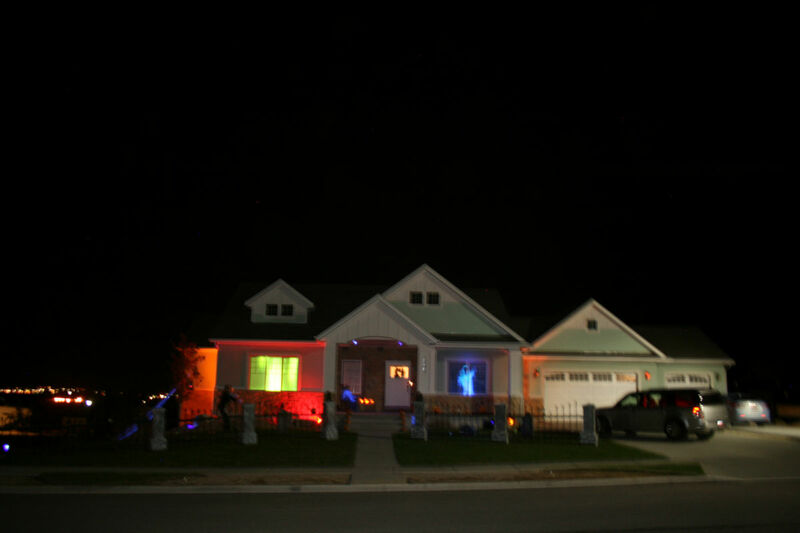 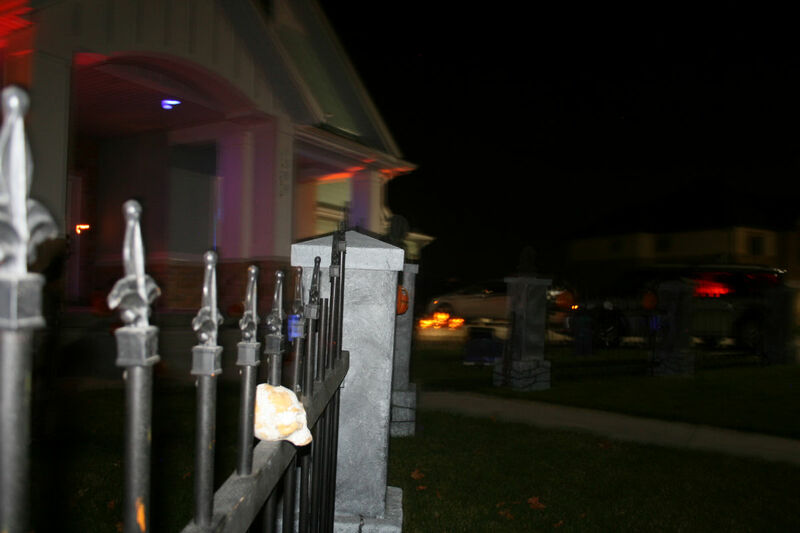 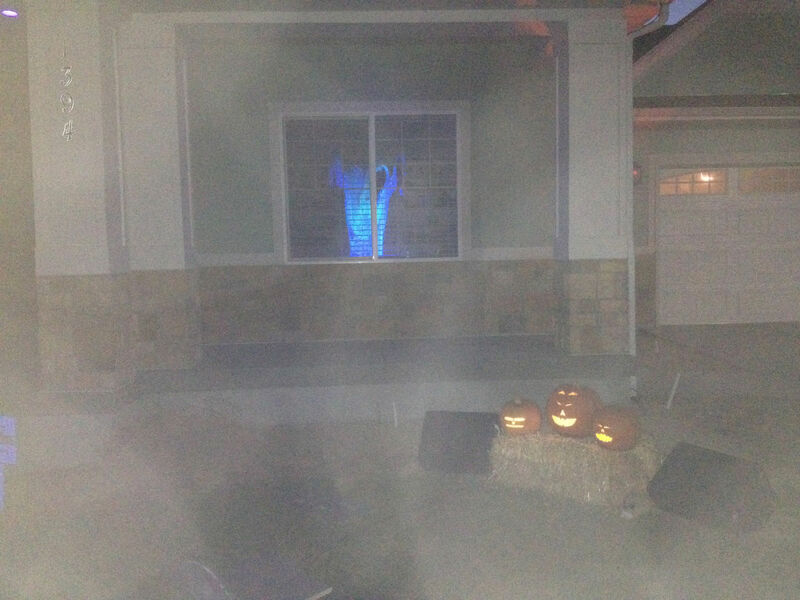 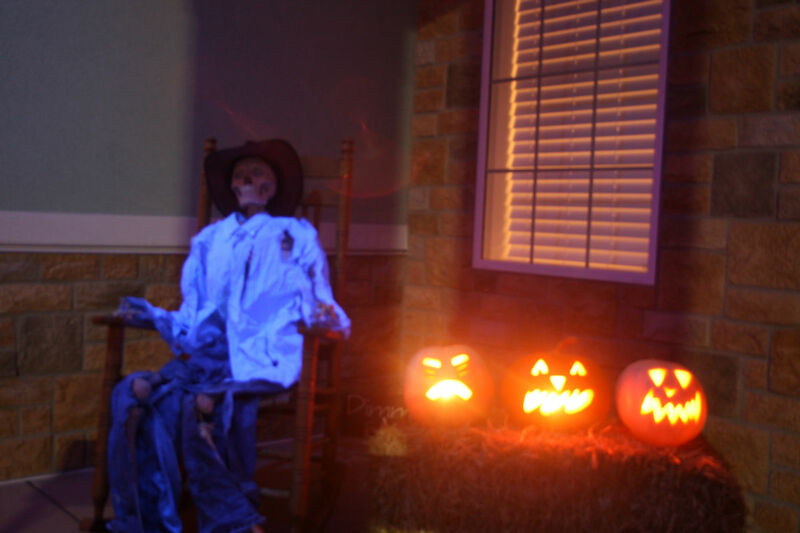 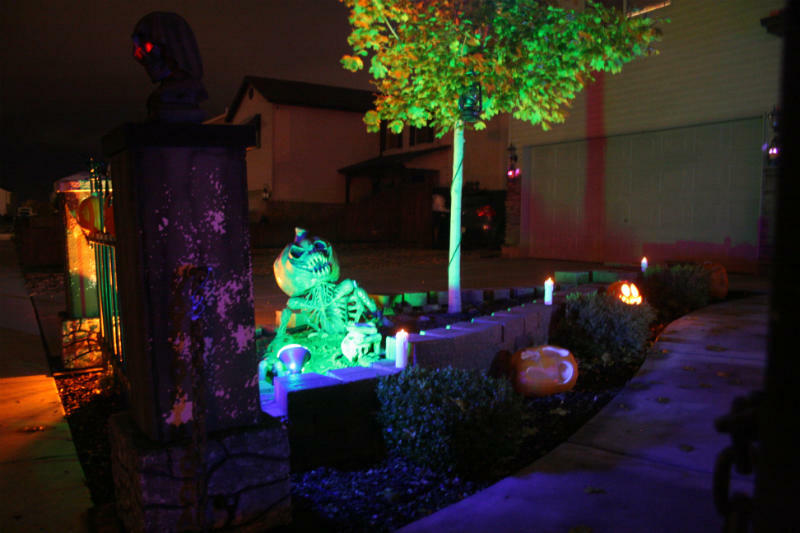 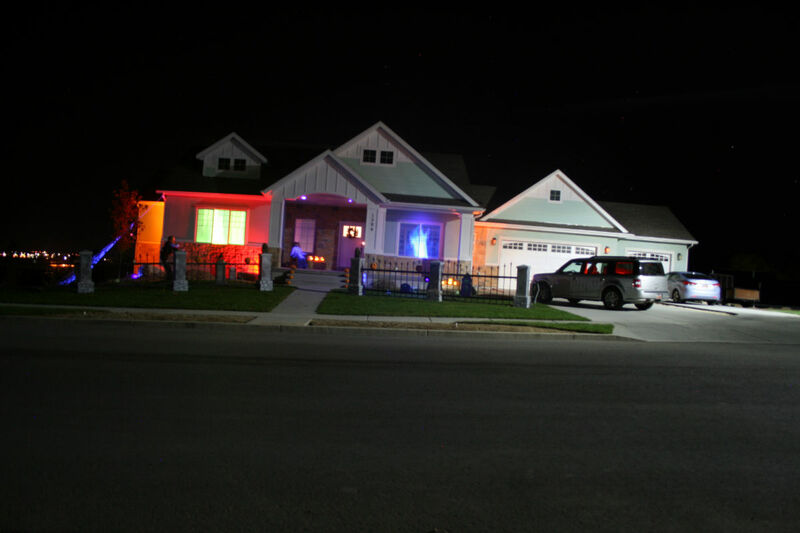 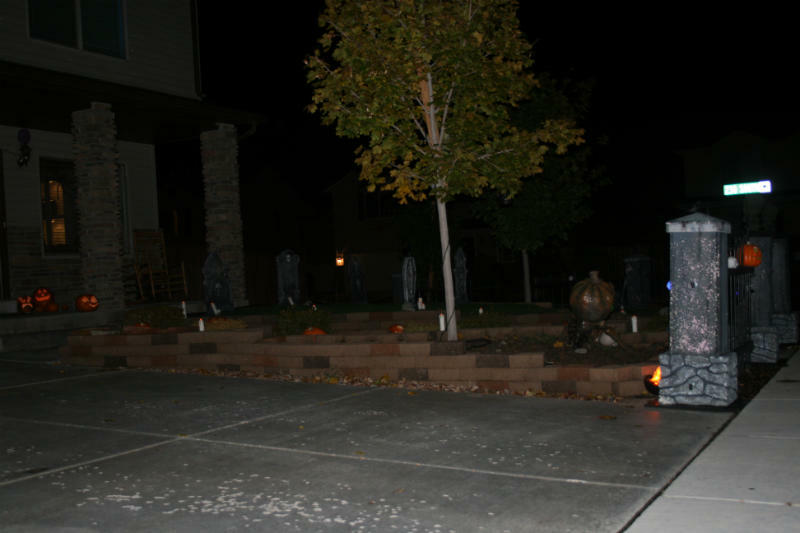 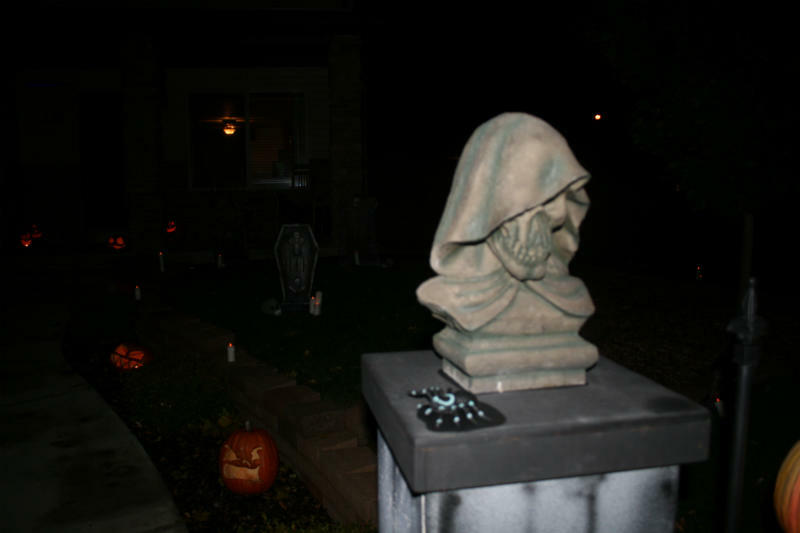 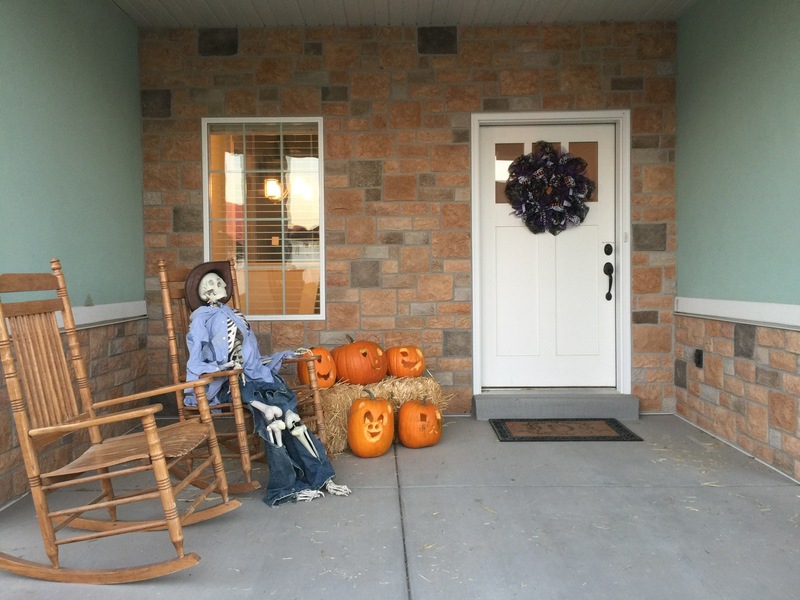 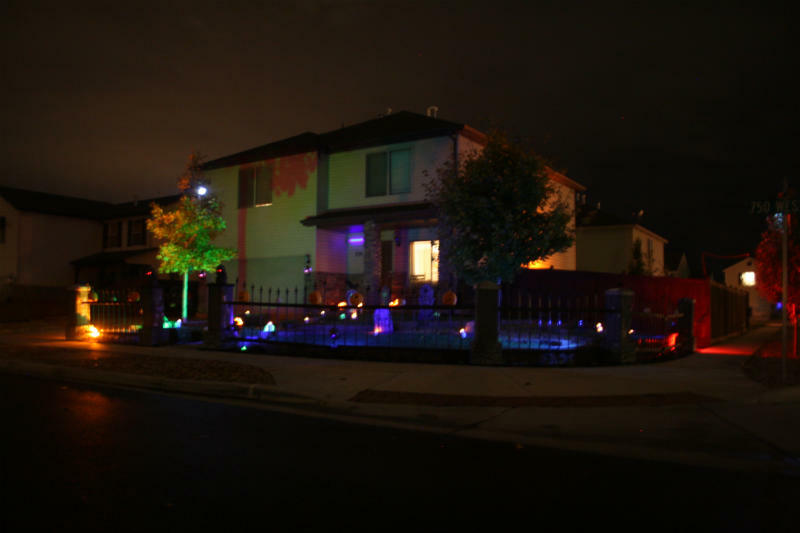 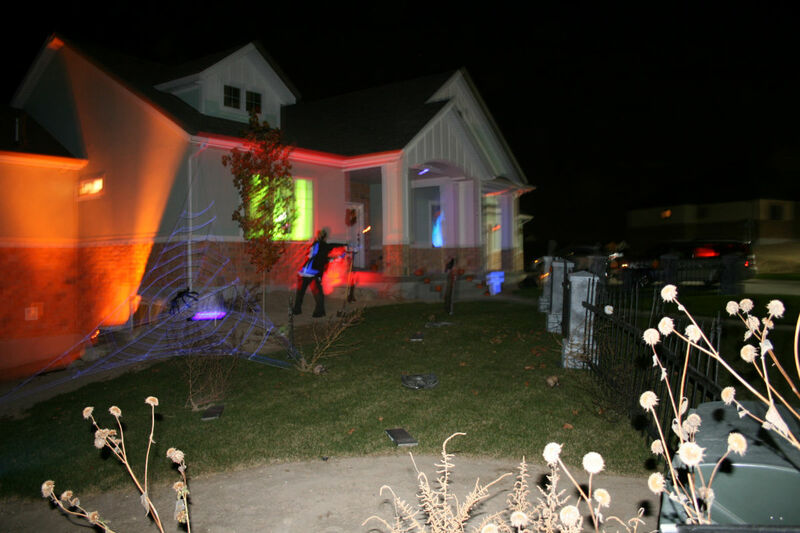 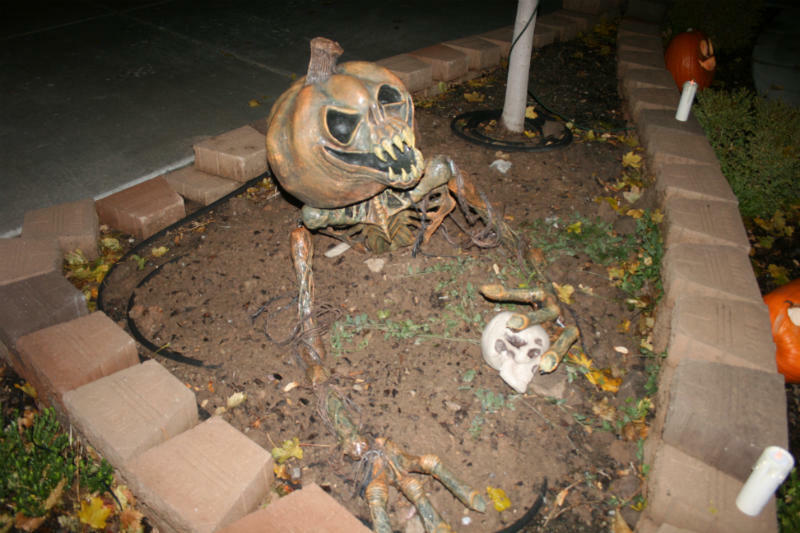 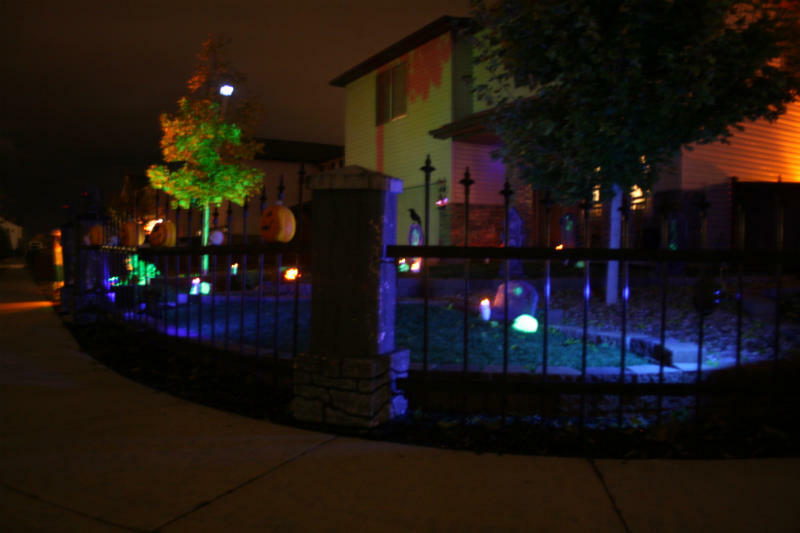 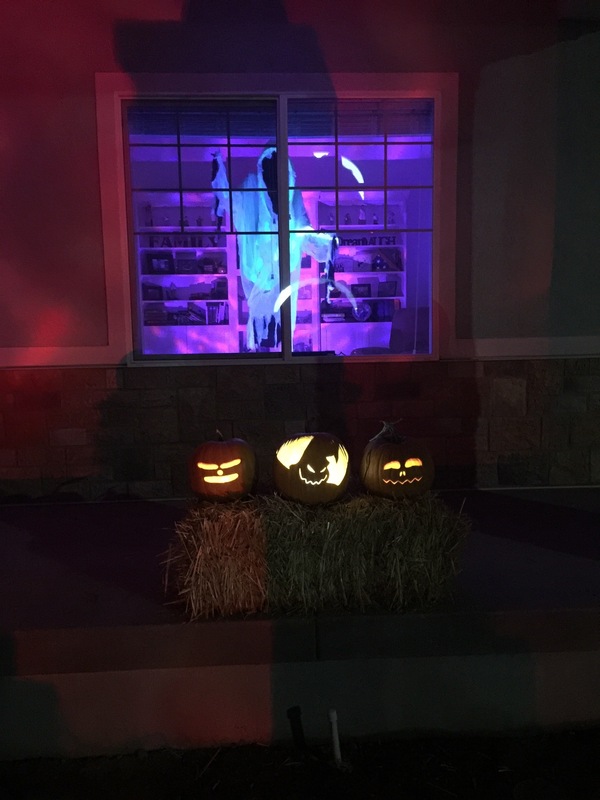 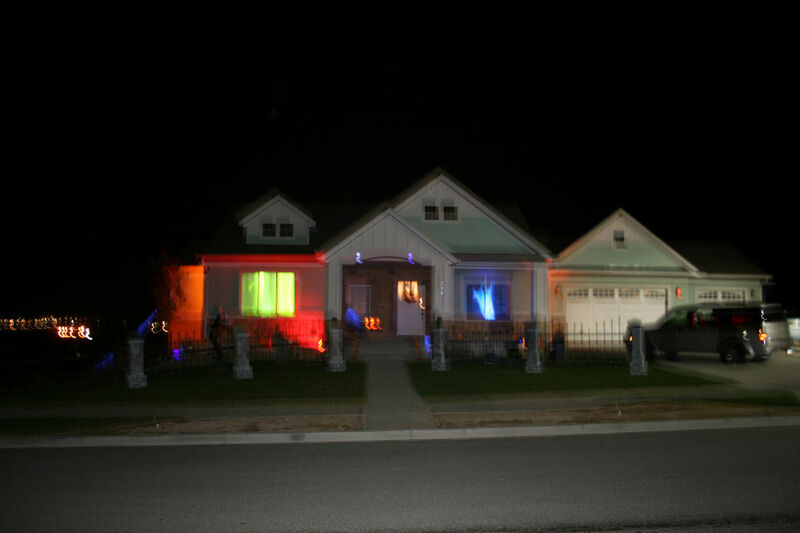 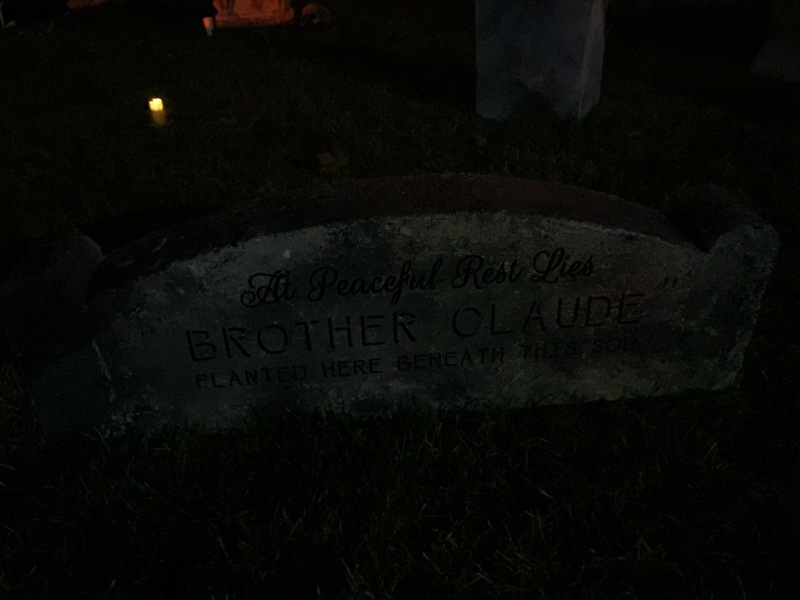 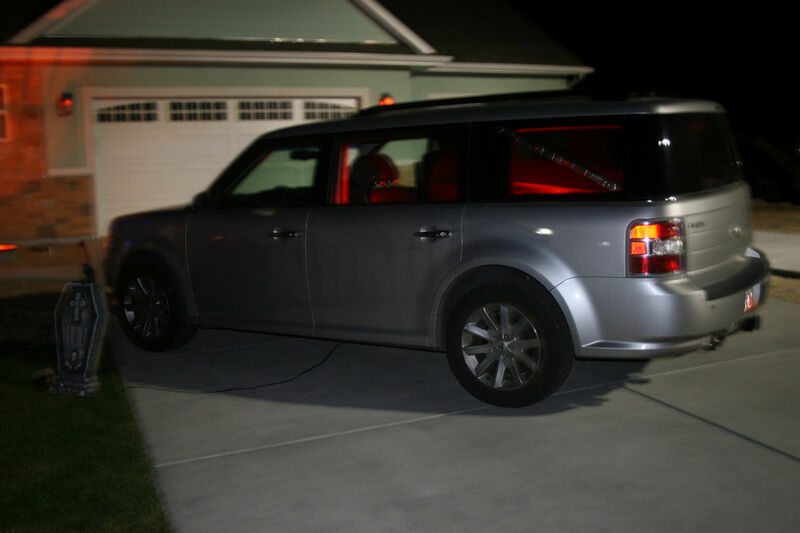 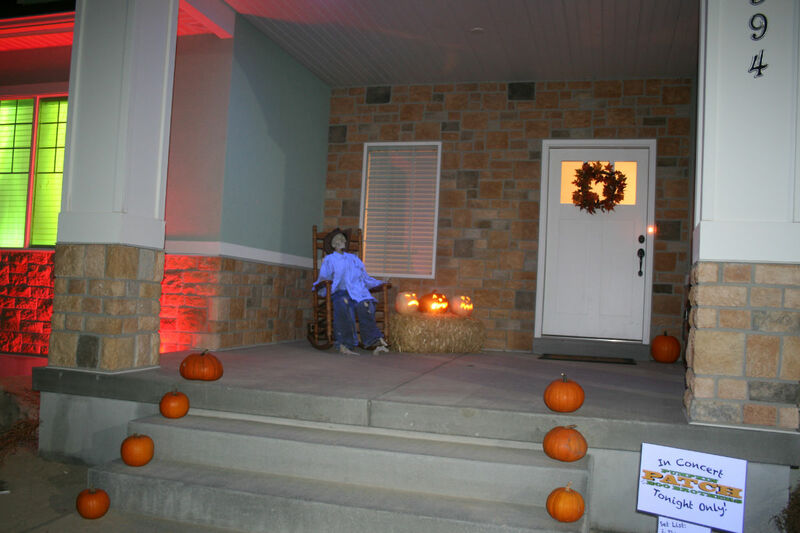 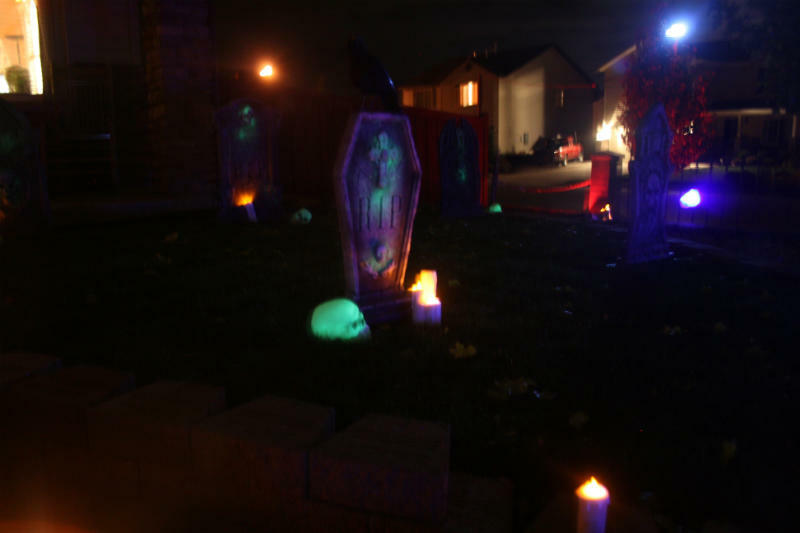 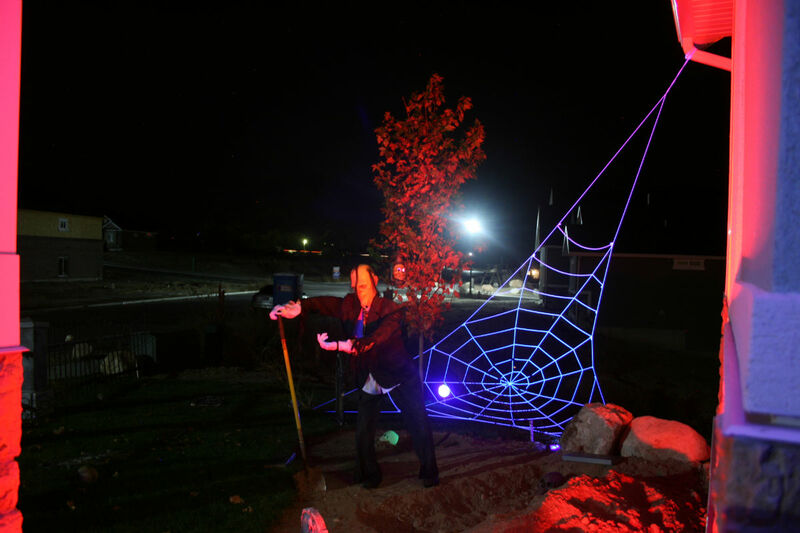 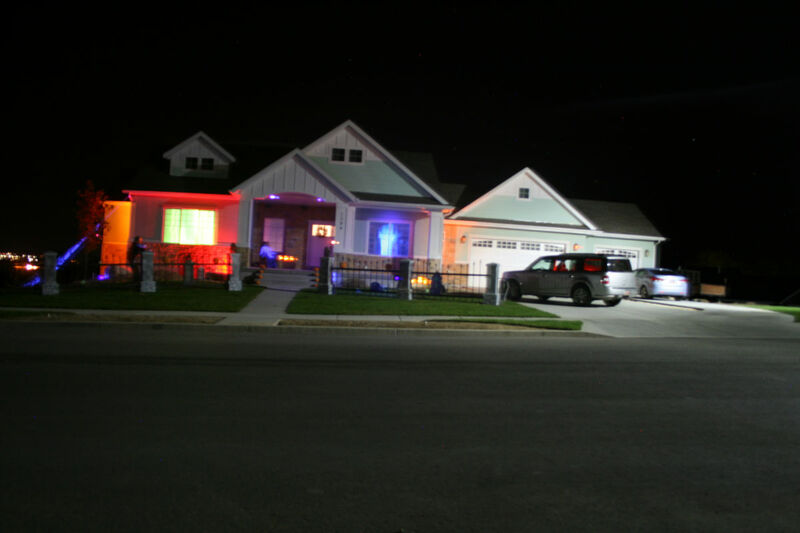 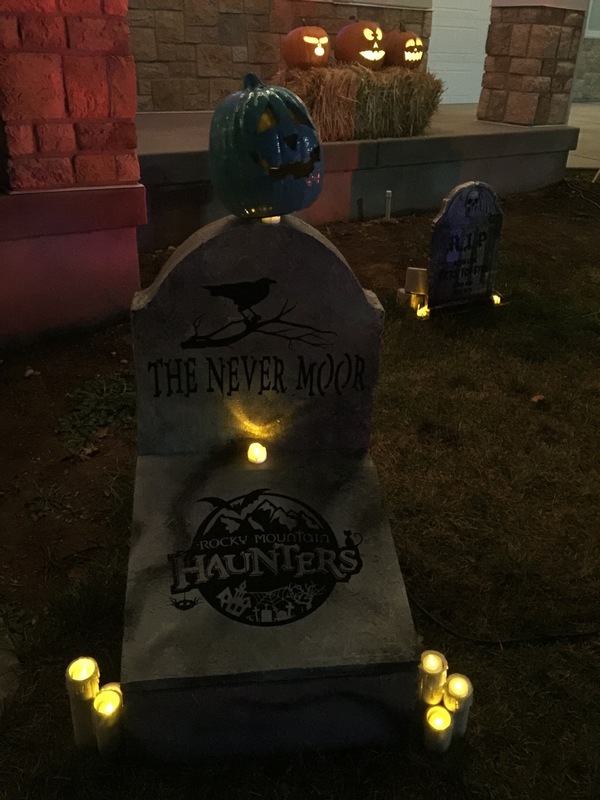 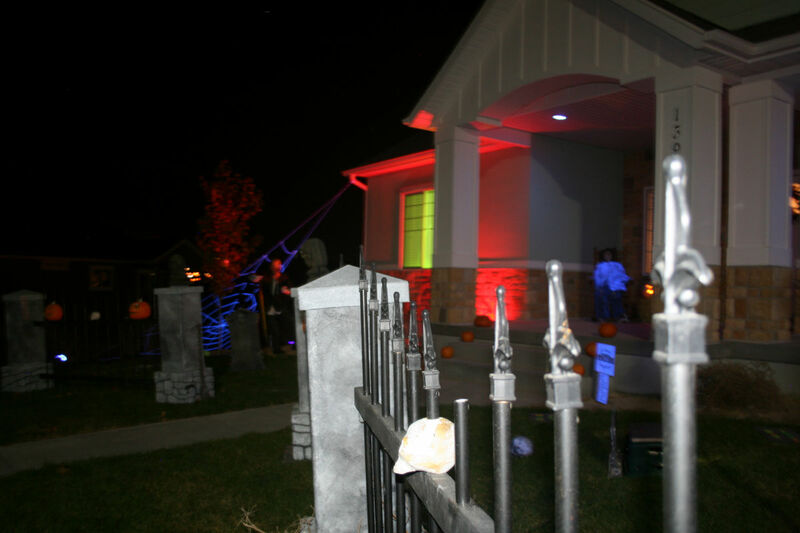 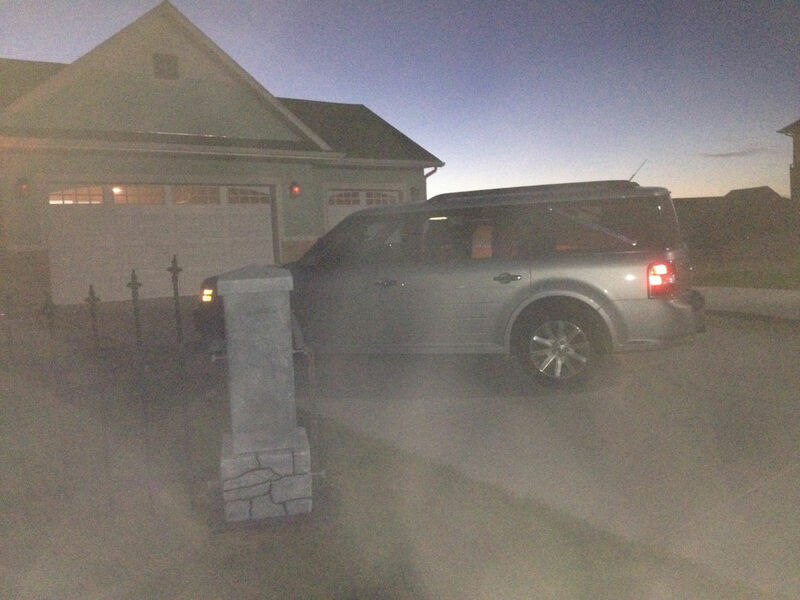 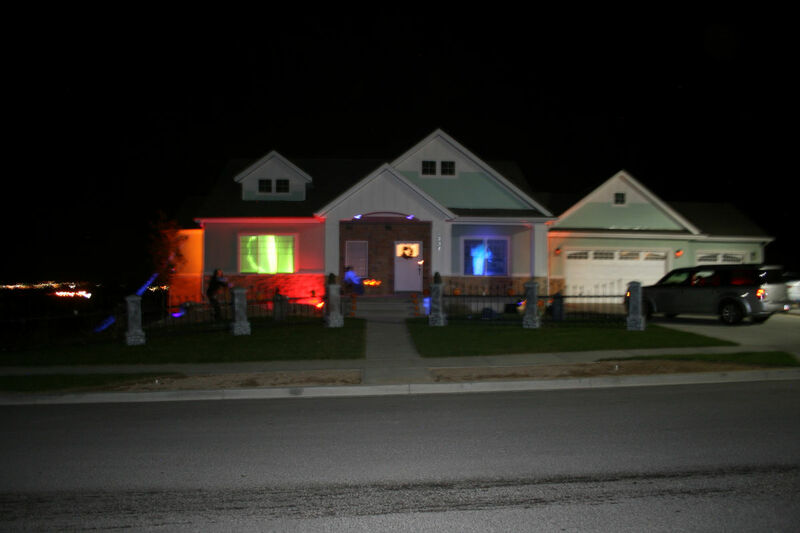 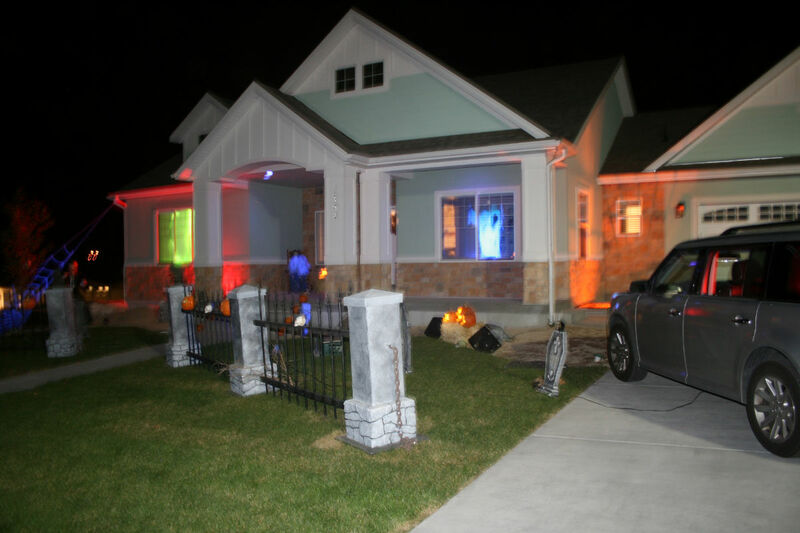 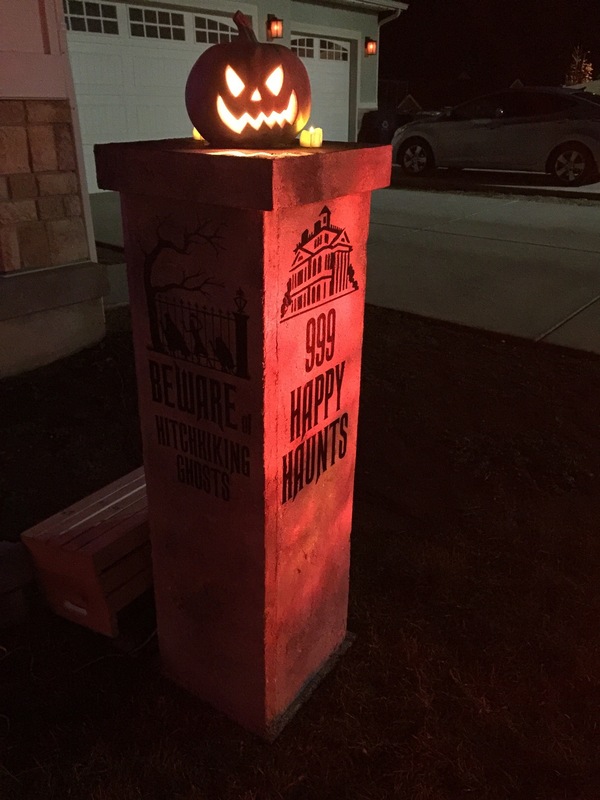 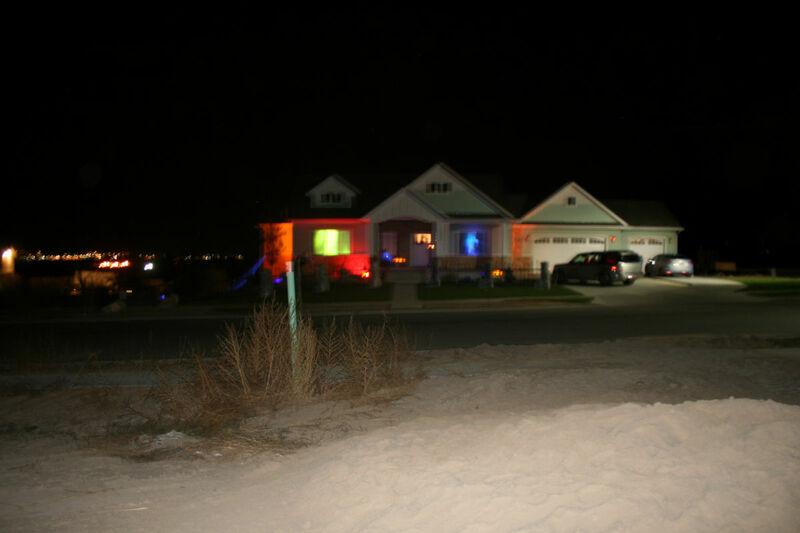 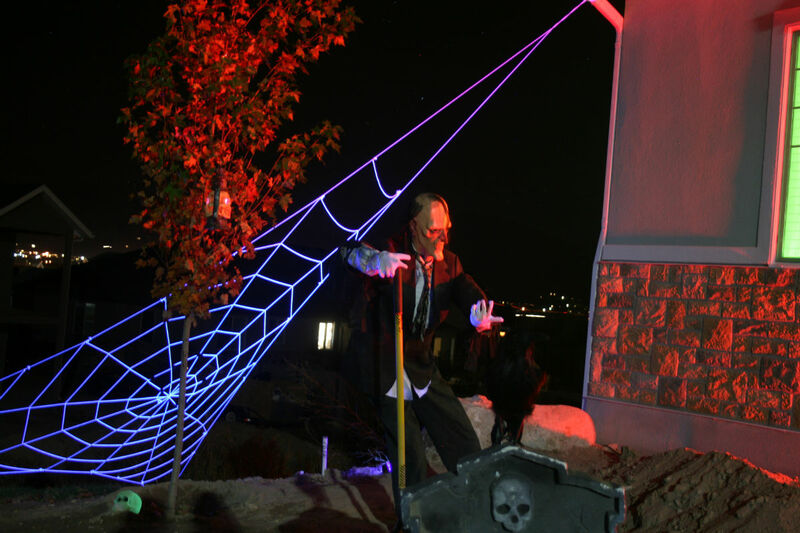 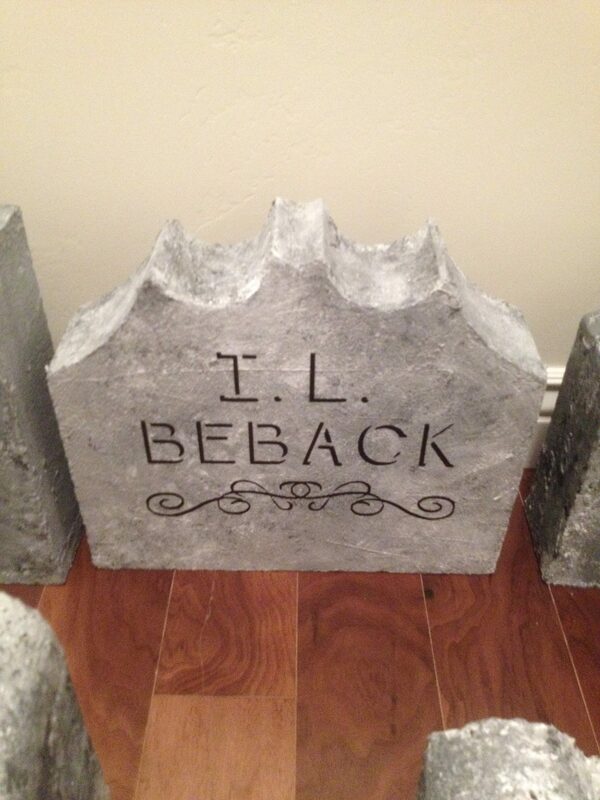 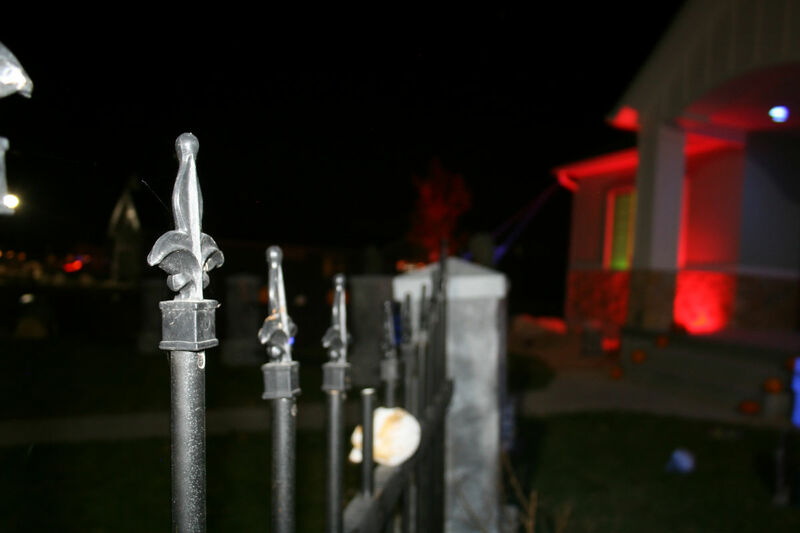 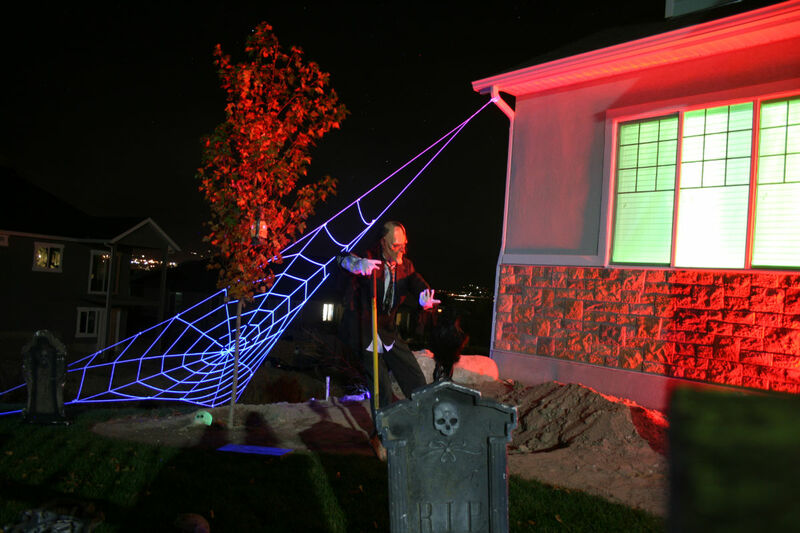 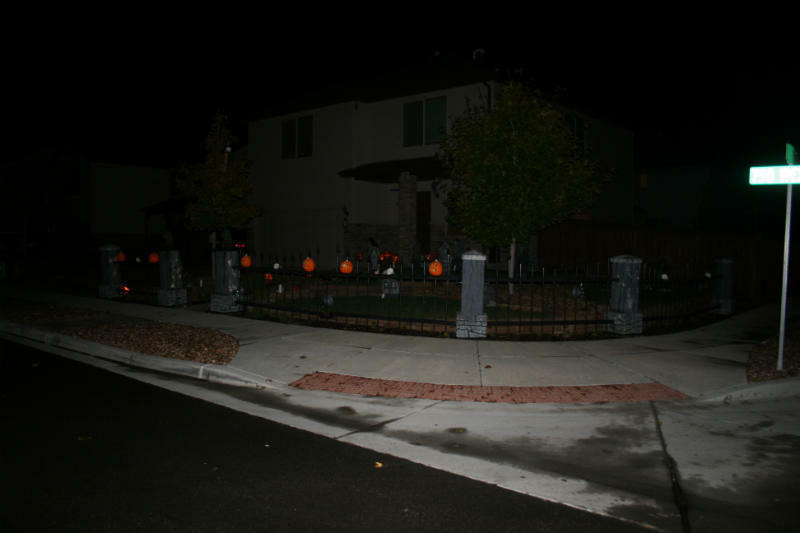 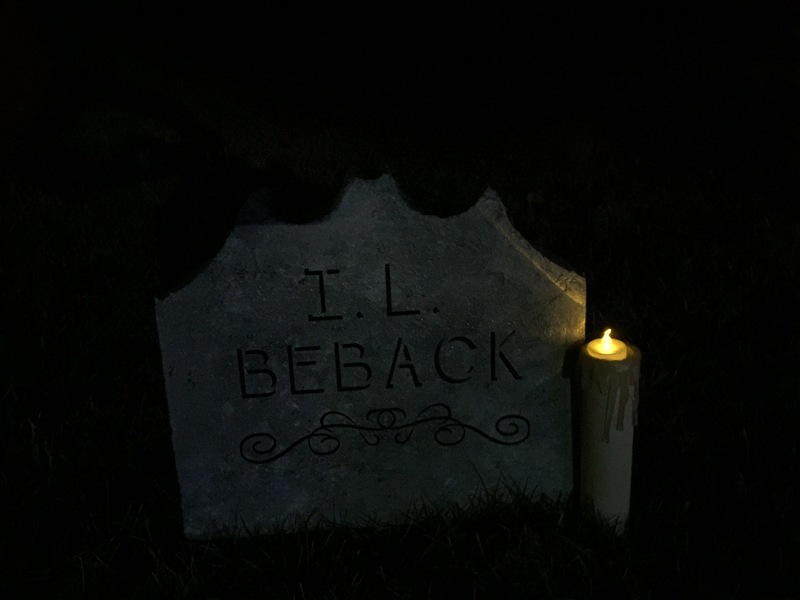 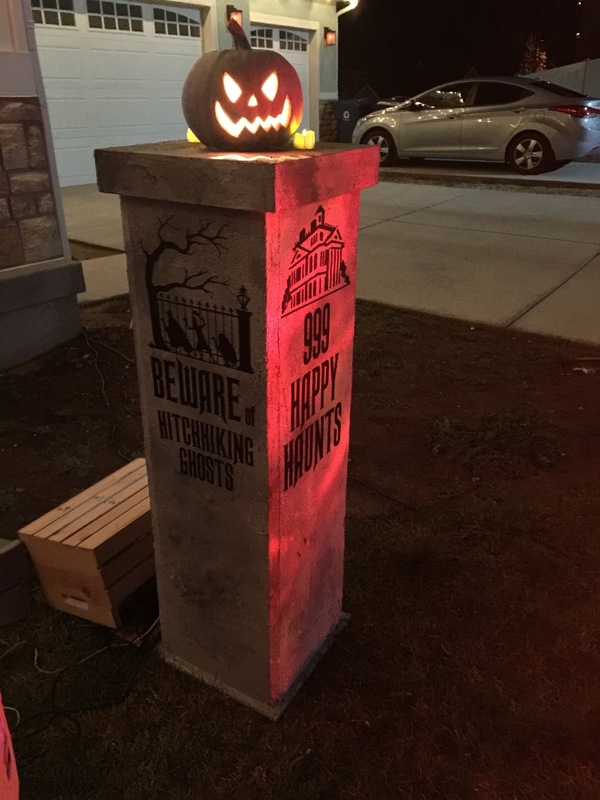 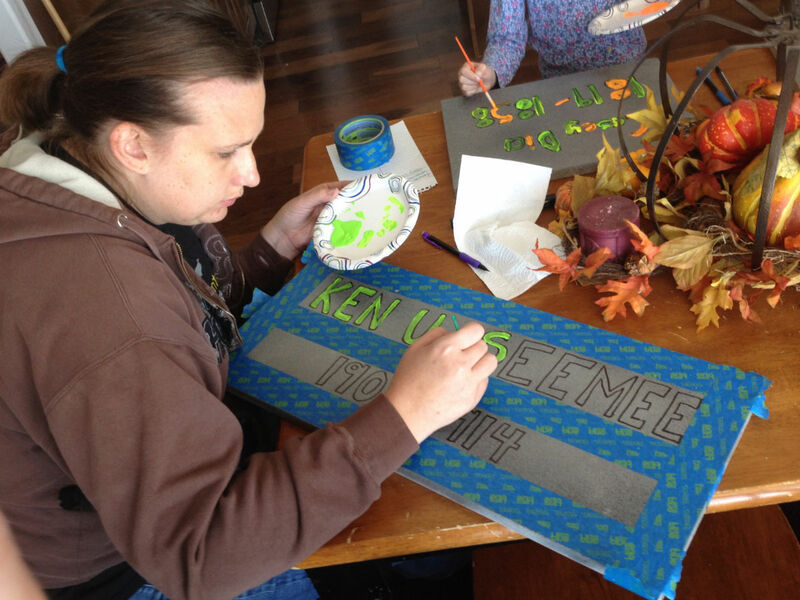 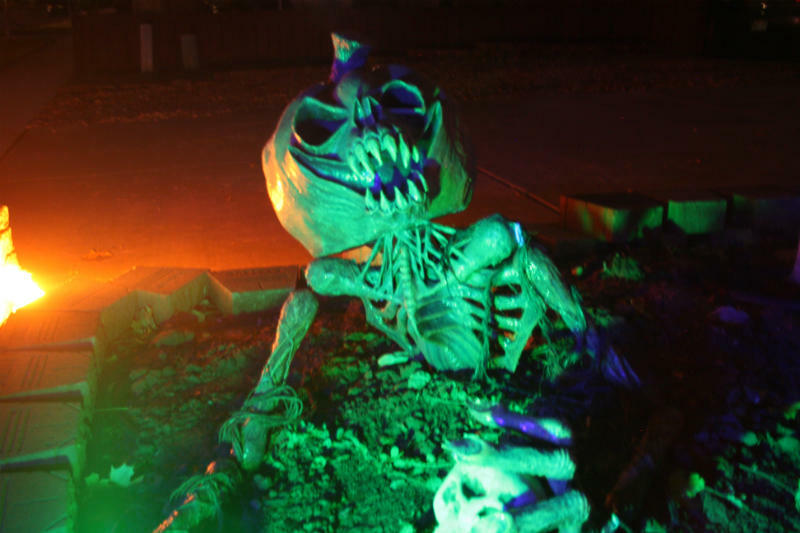 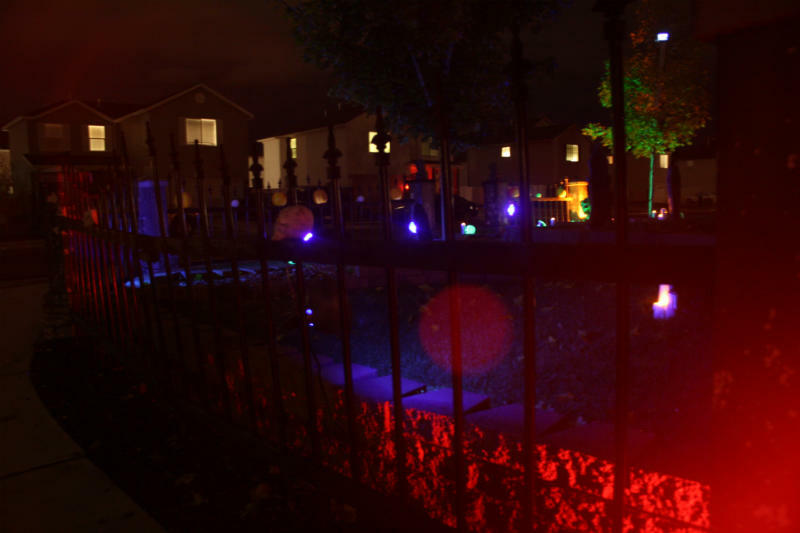 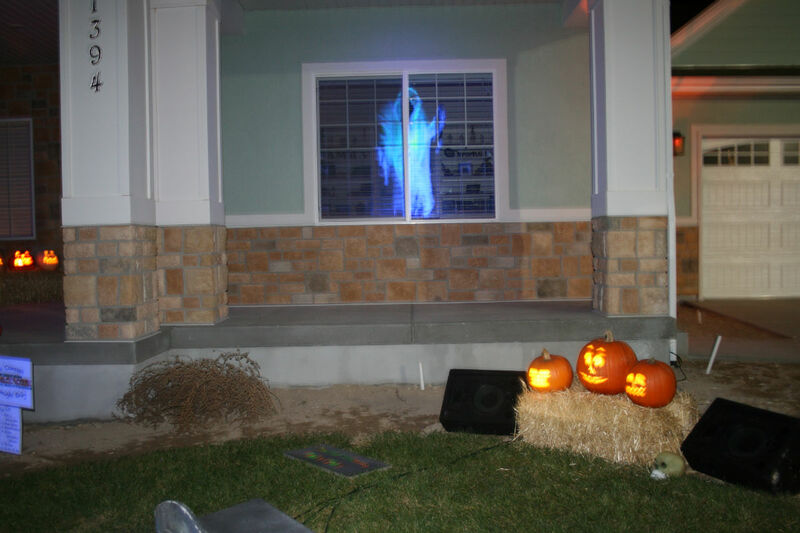 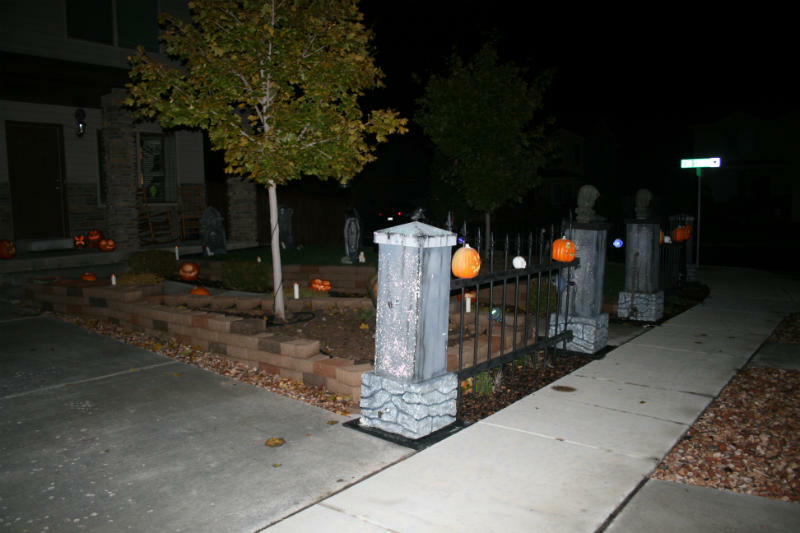 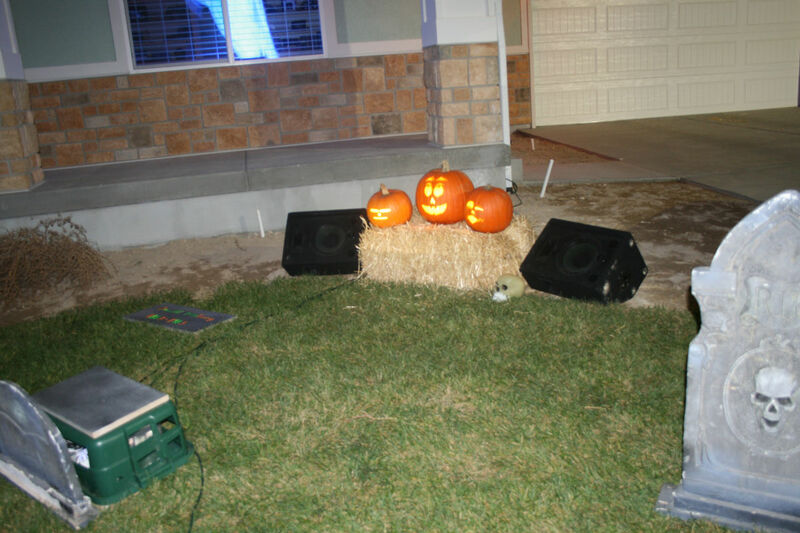 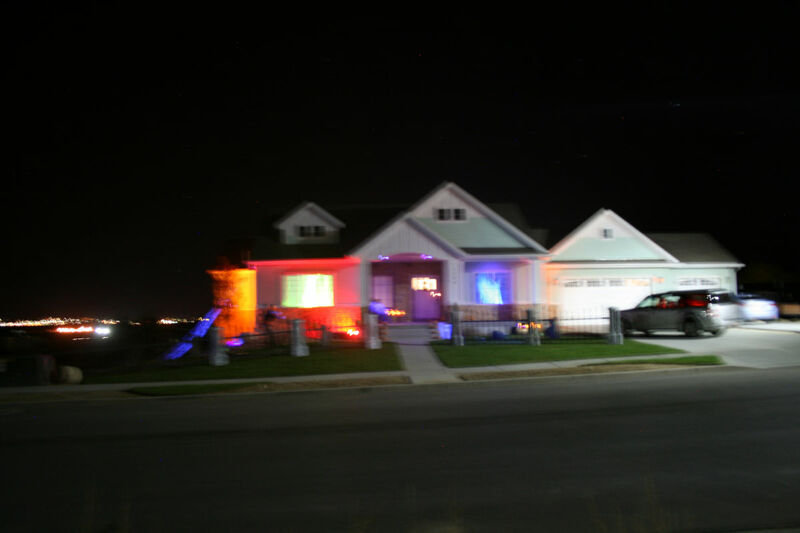 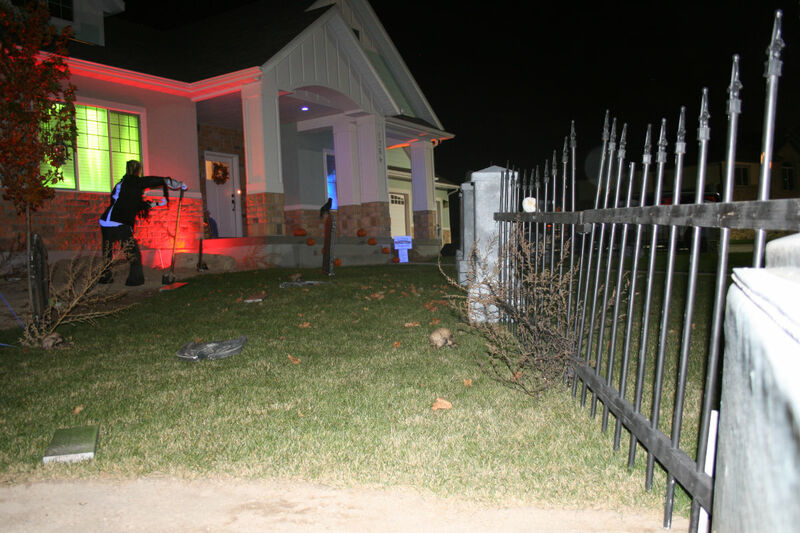 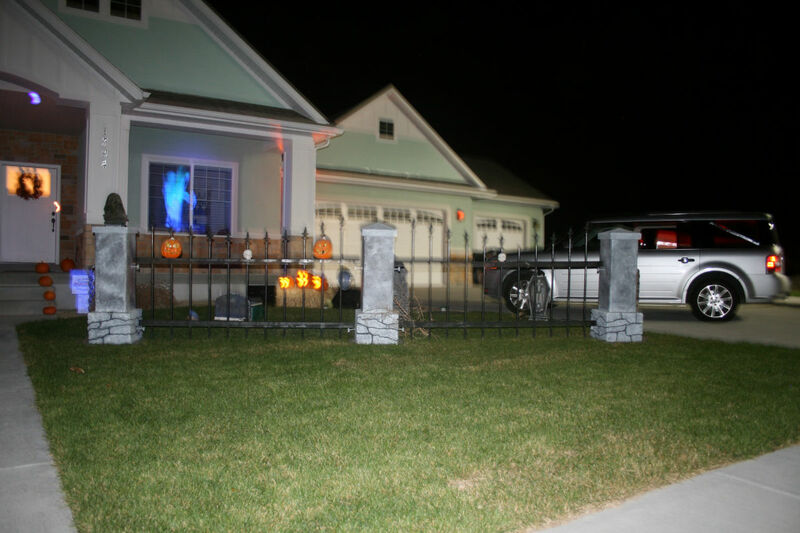 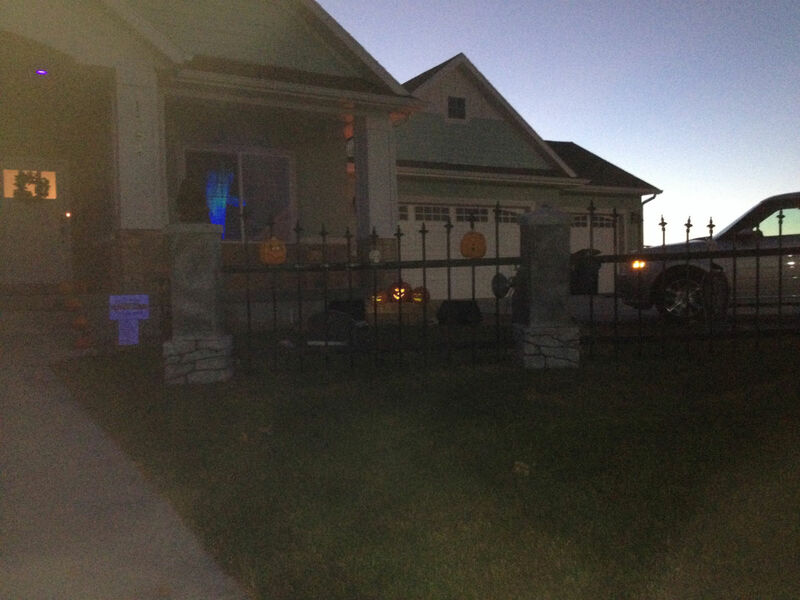 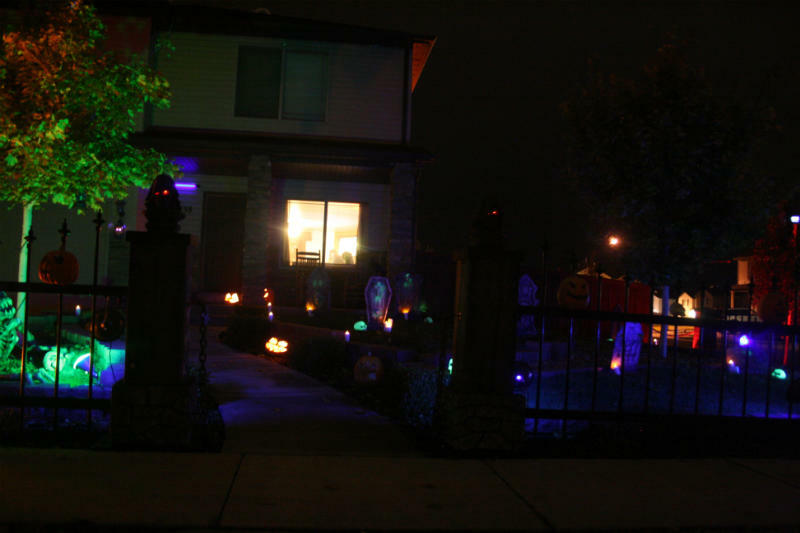 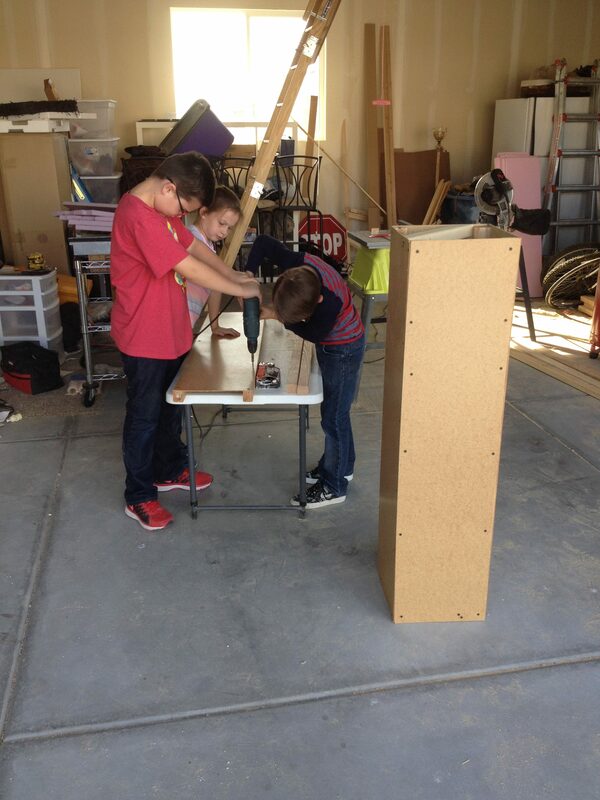 We added about 20 new tombstones and props to our haunt. 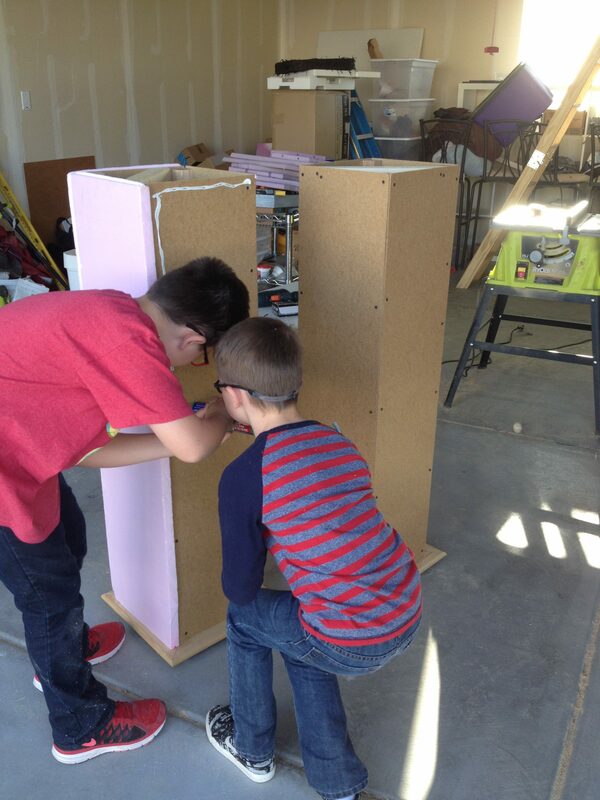 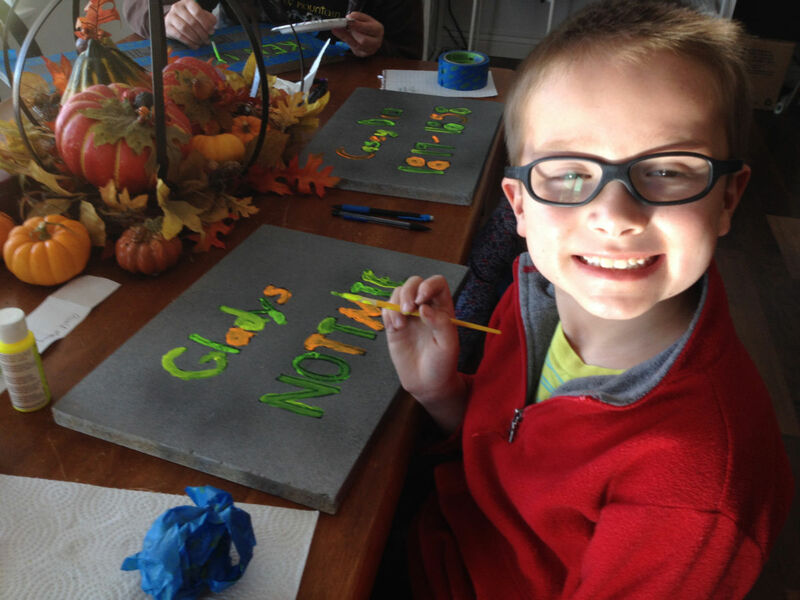 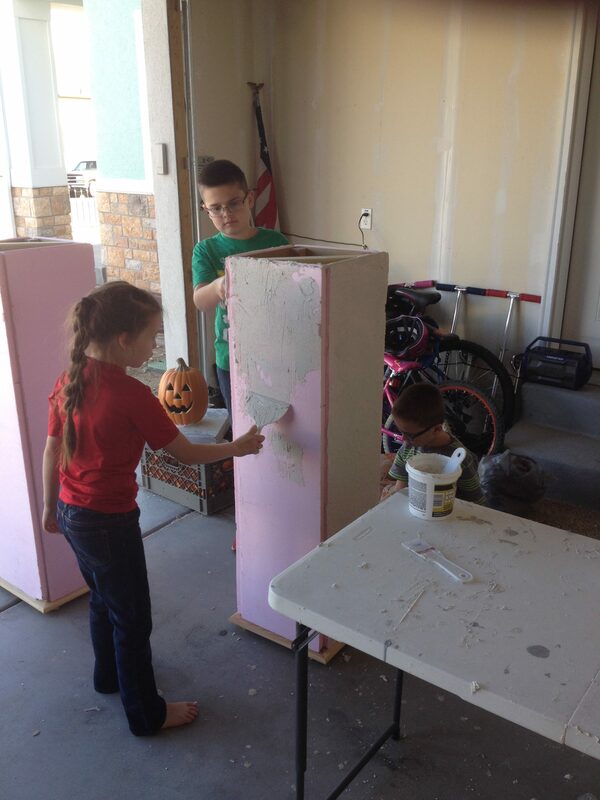 My kids really helped me A LOT (you’ll see in the video). 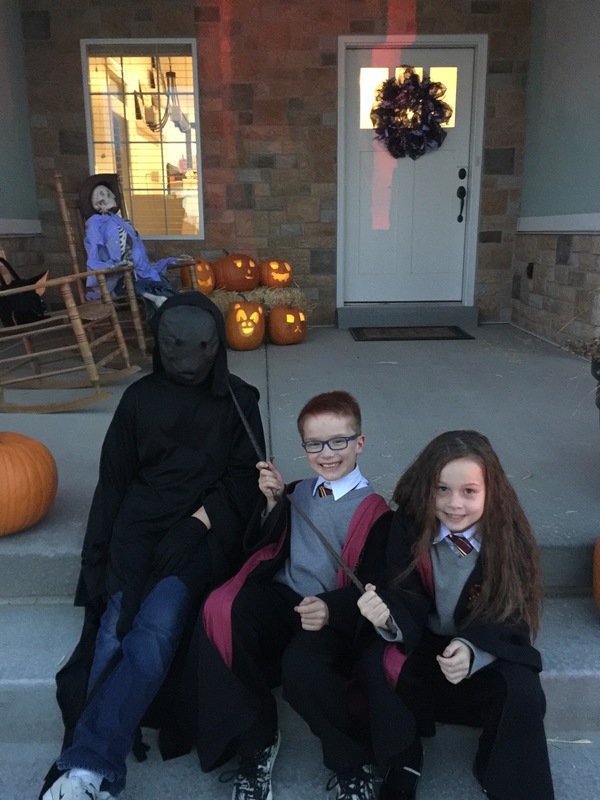 Our costume theme for this year were characters from the Harry Potter books/movies. 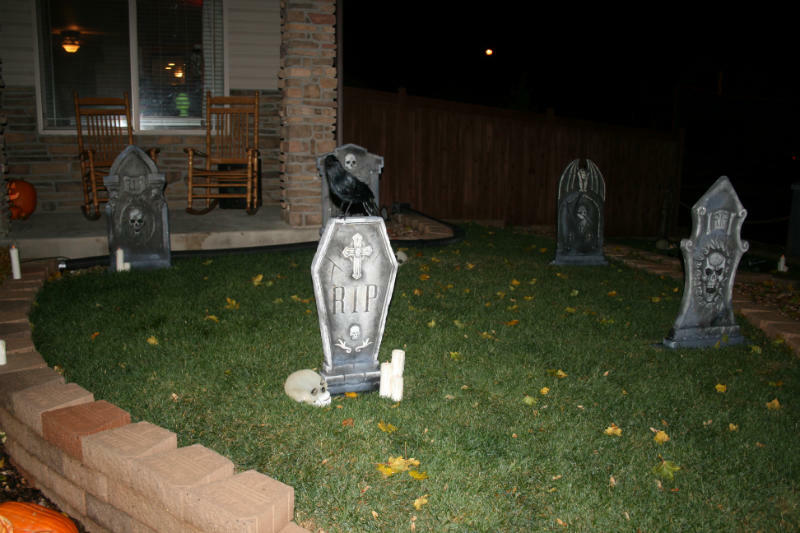 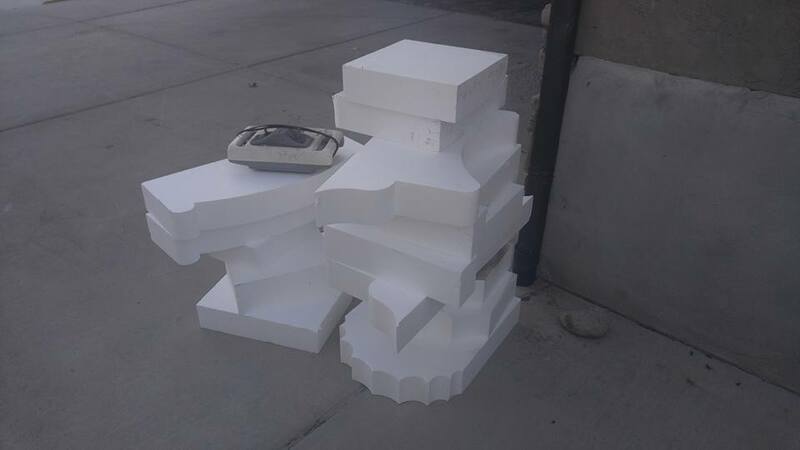 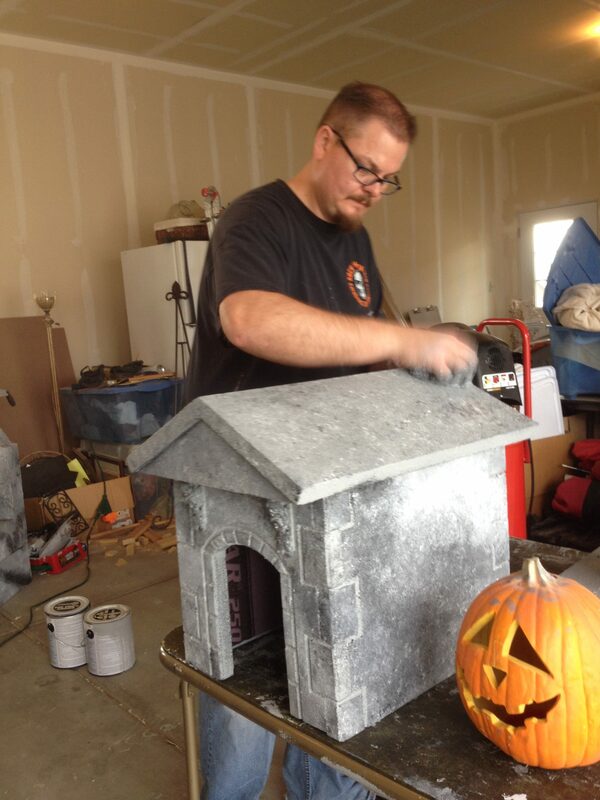 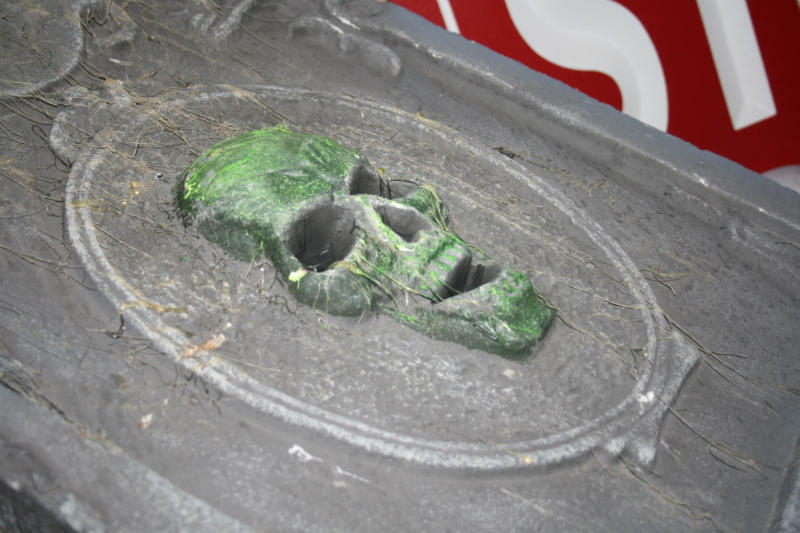 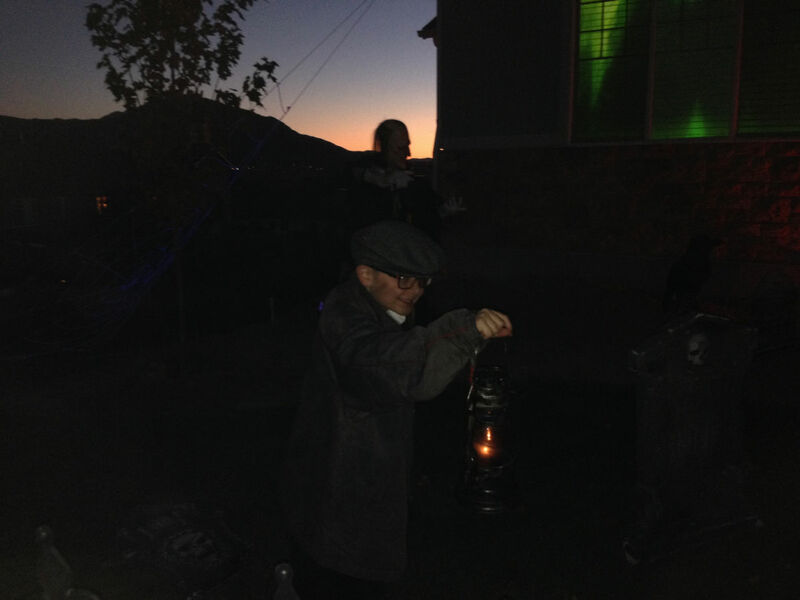 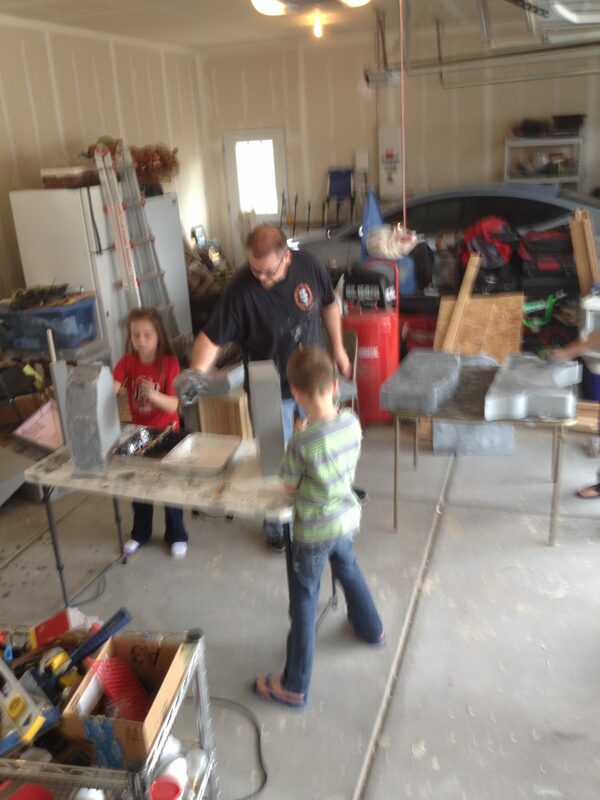 Thank you to Jason Hogan, another member of the Rocky Mountain Haunters, for giving us 14 tombstone blanks. 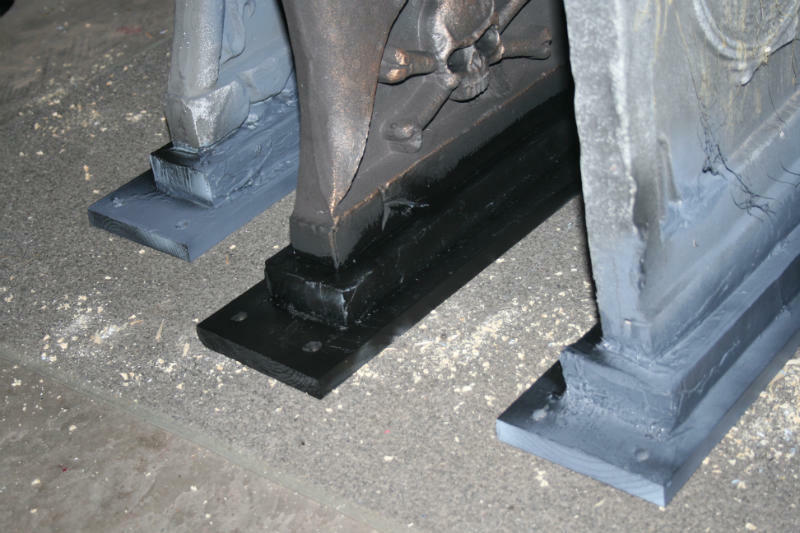 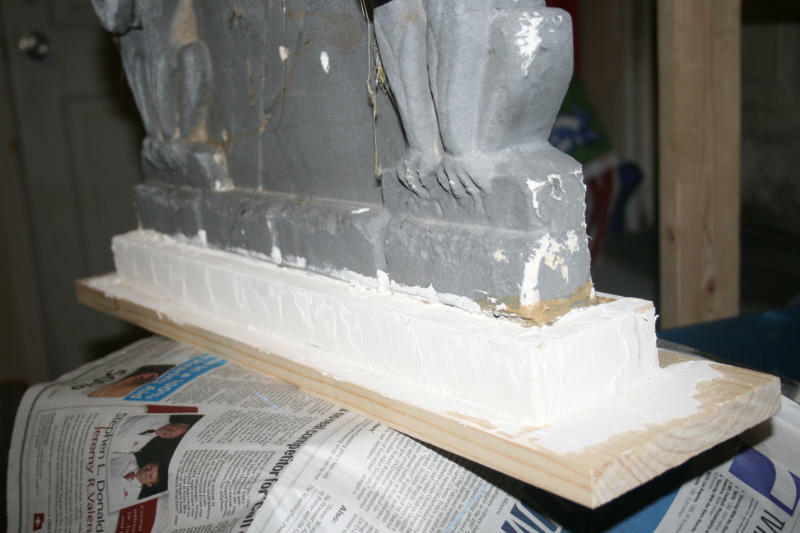 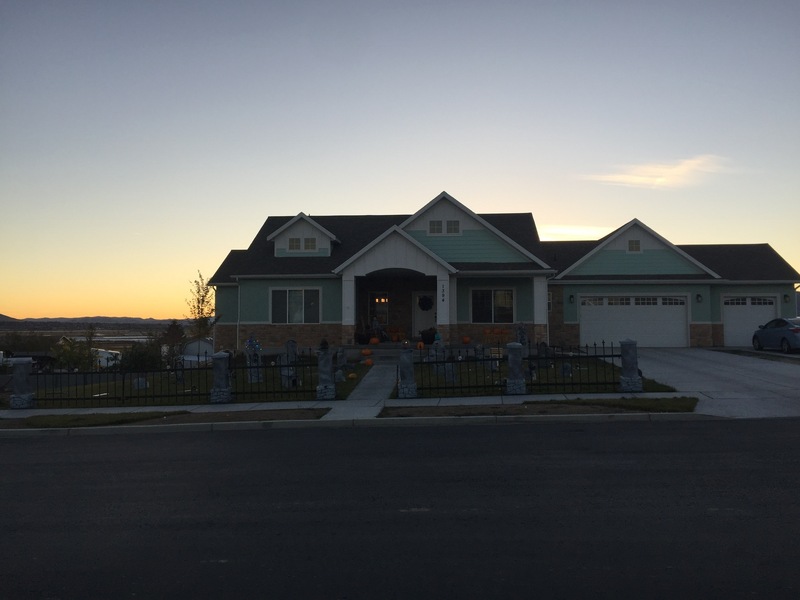 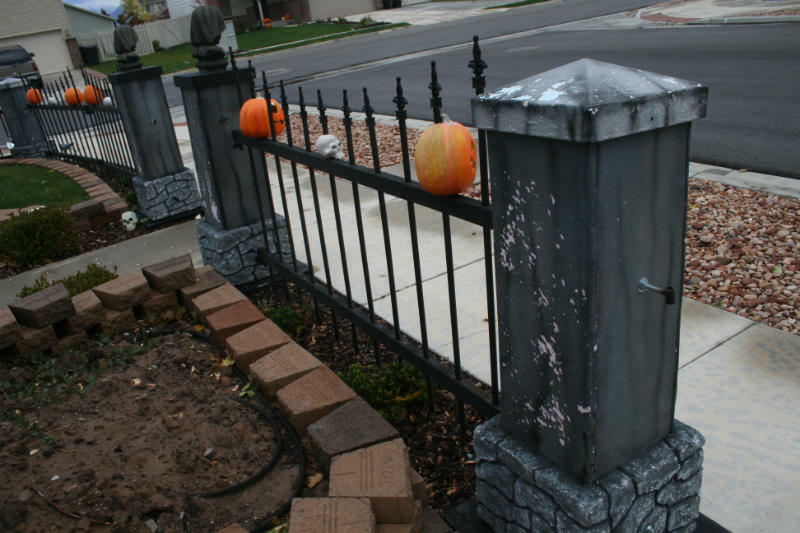 We covered and sealed the foam blanks with Stucco Patch, then painted with gray exterior primer, and then flat black and white exterior paint. 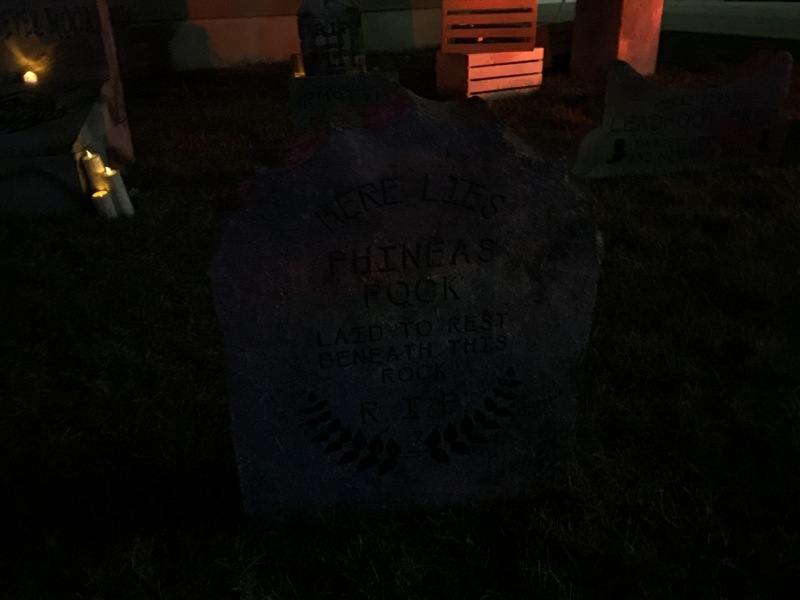 My wife cut vinyl epitaphs with her Silhouette that turned out amazing. 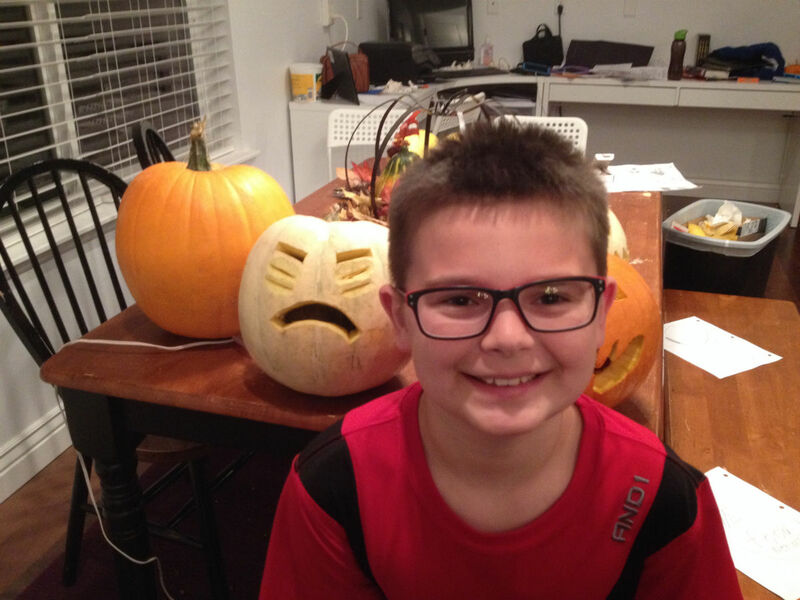 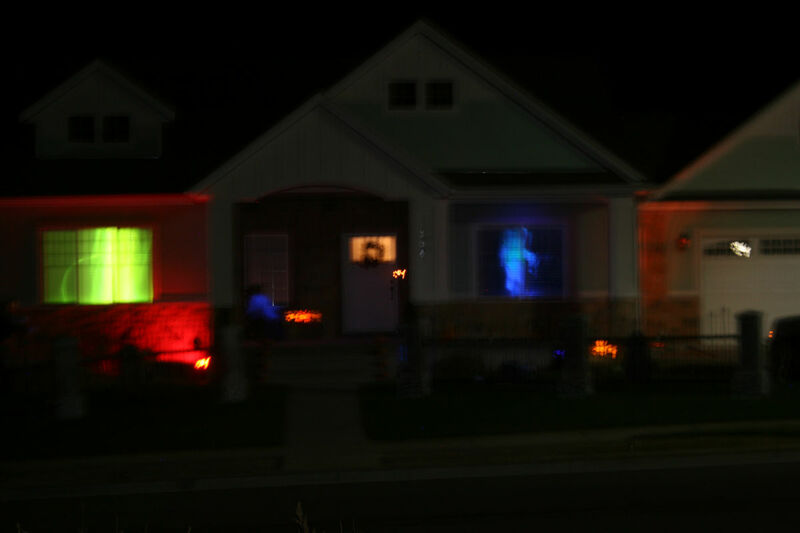 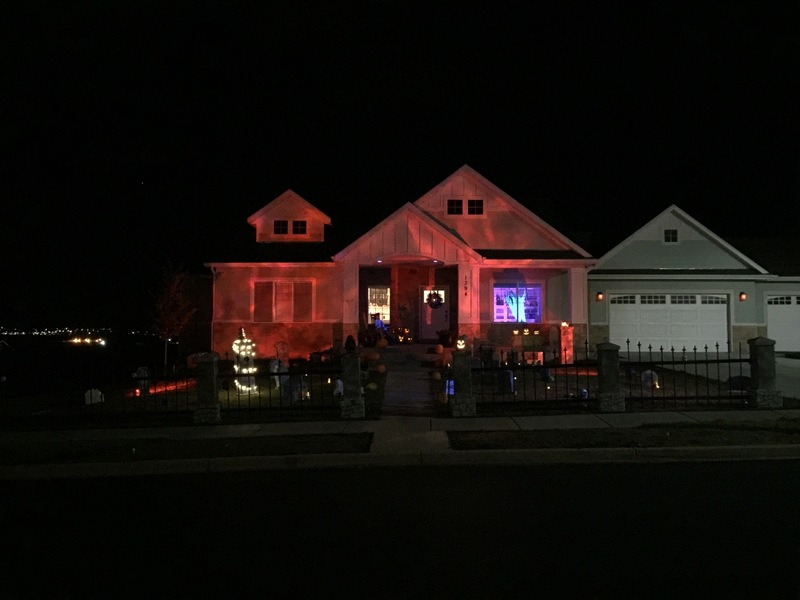 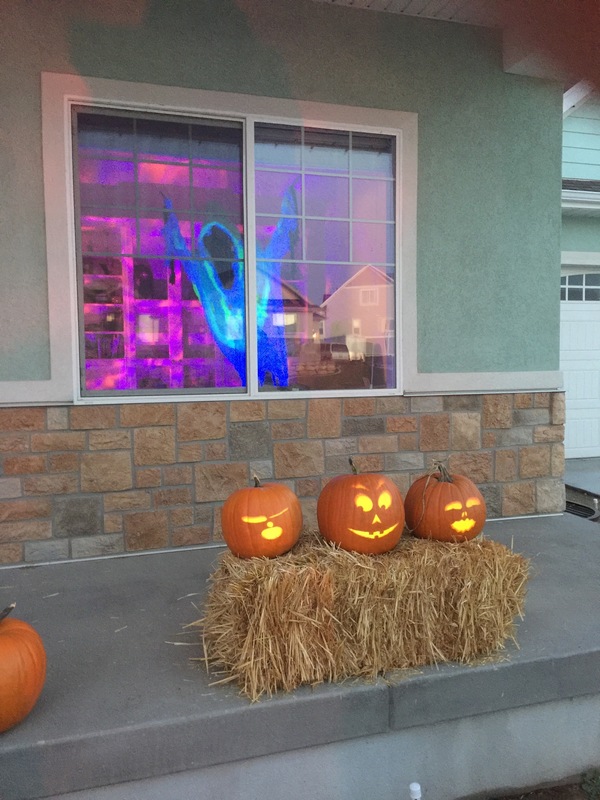 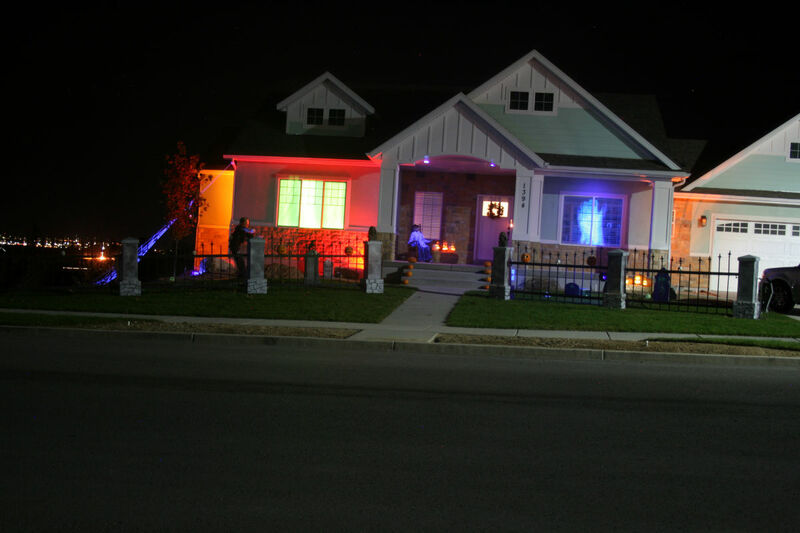 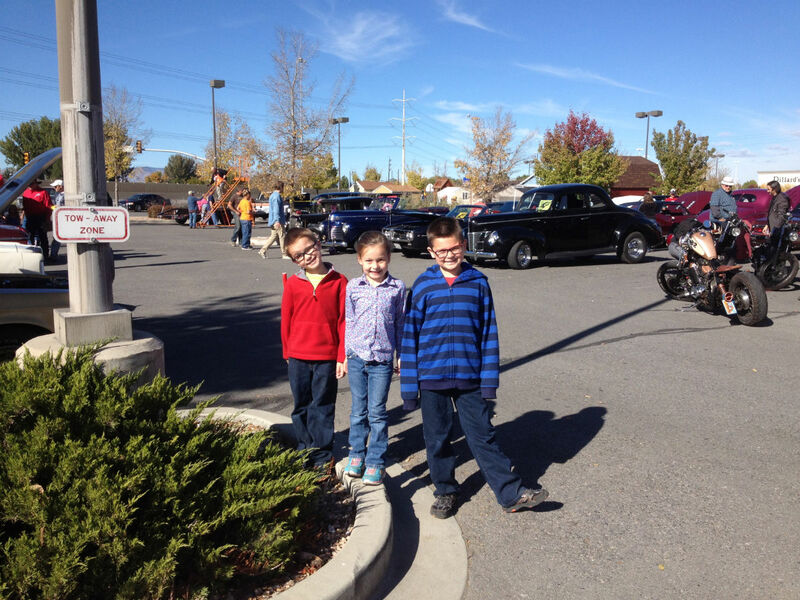 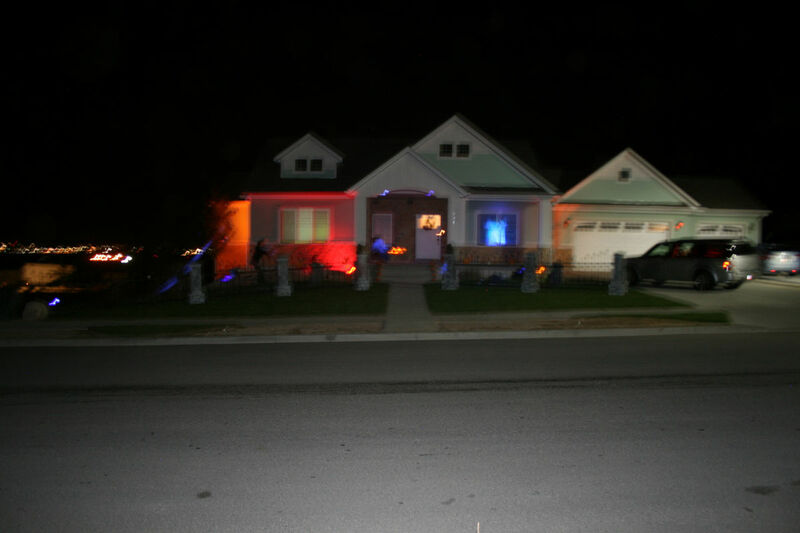 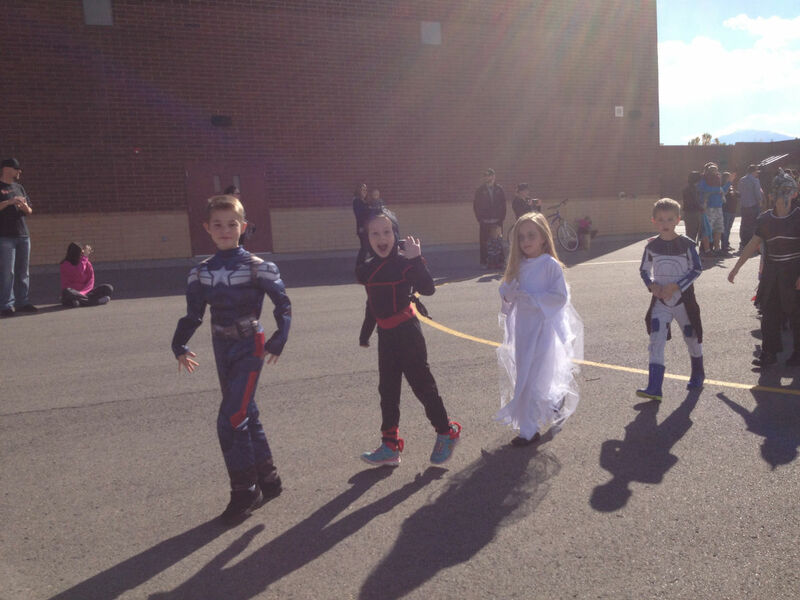 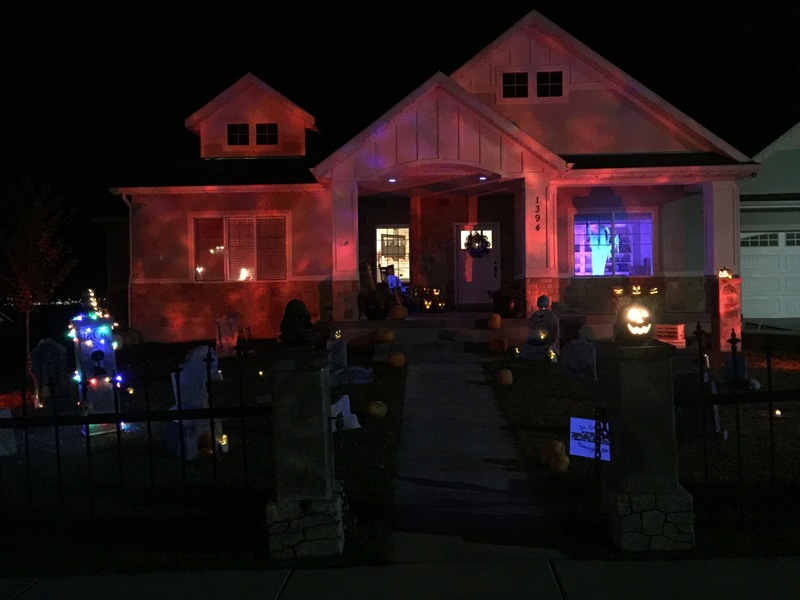 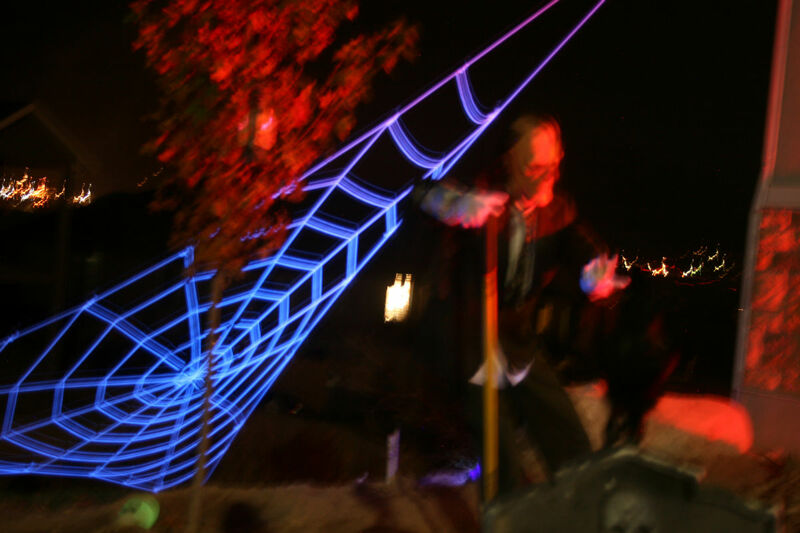 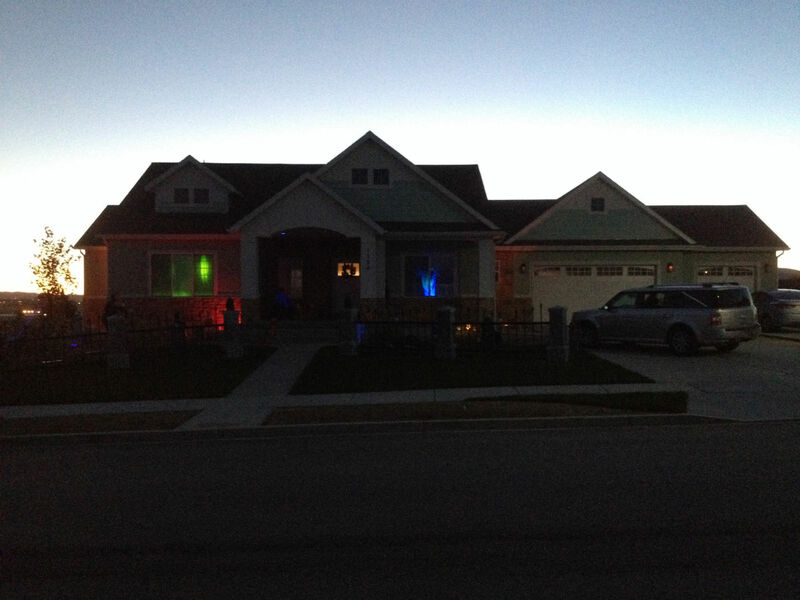 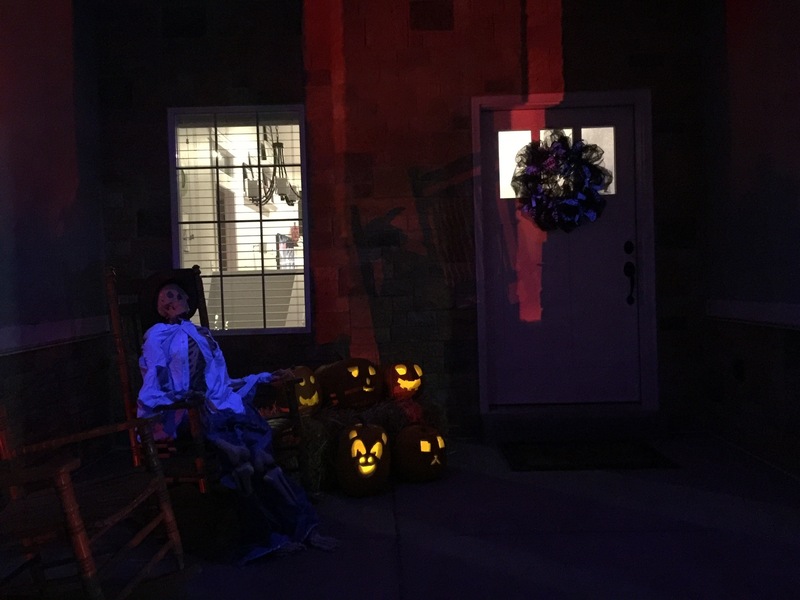 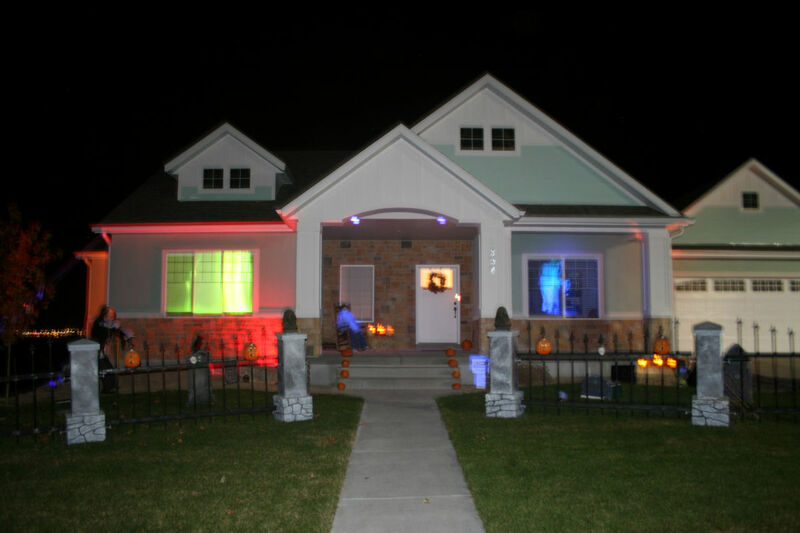 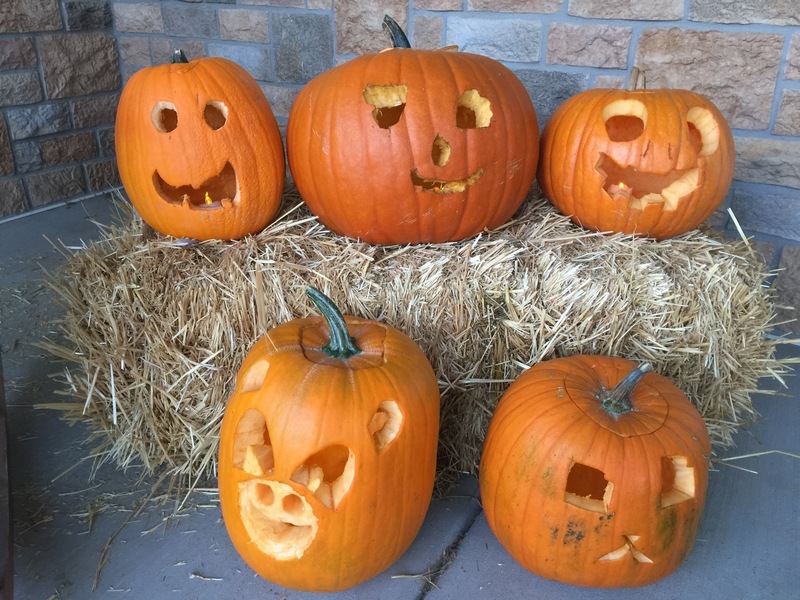 This year’s Halloween was very trying and frustrating. 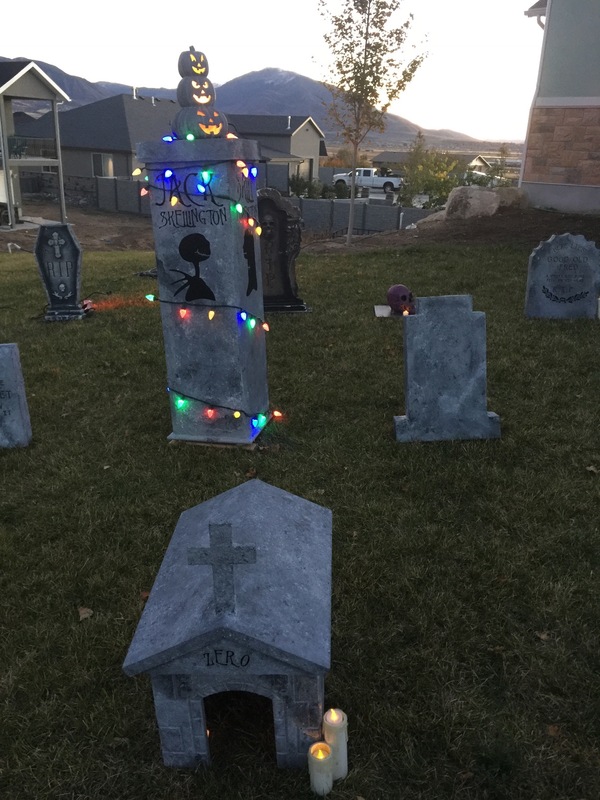 After last week’s storm that damaged the fence and tombstones and having to repair them, then a hail and wind storm hit shortly before the ToTs were to start that broke one more tombstone and removed paint from the fence columns again, I was ready to throw in the towel and call it quits for the year. 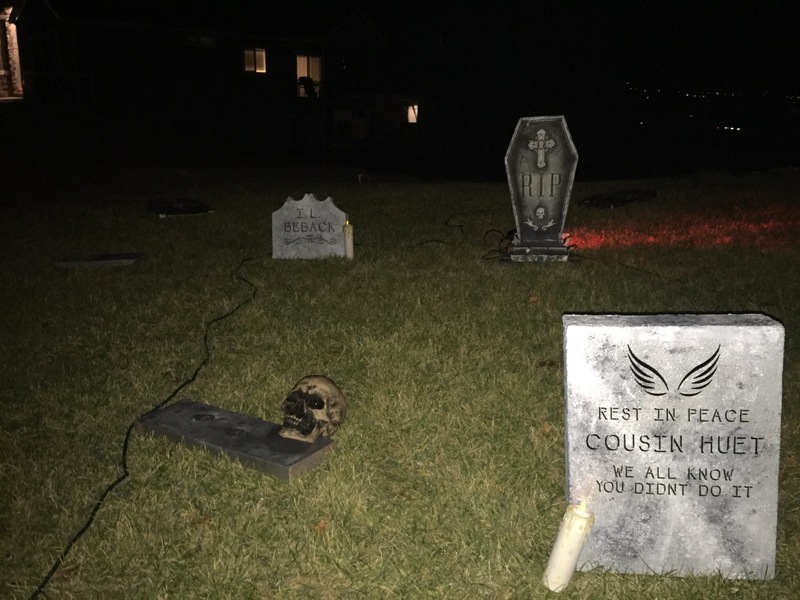 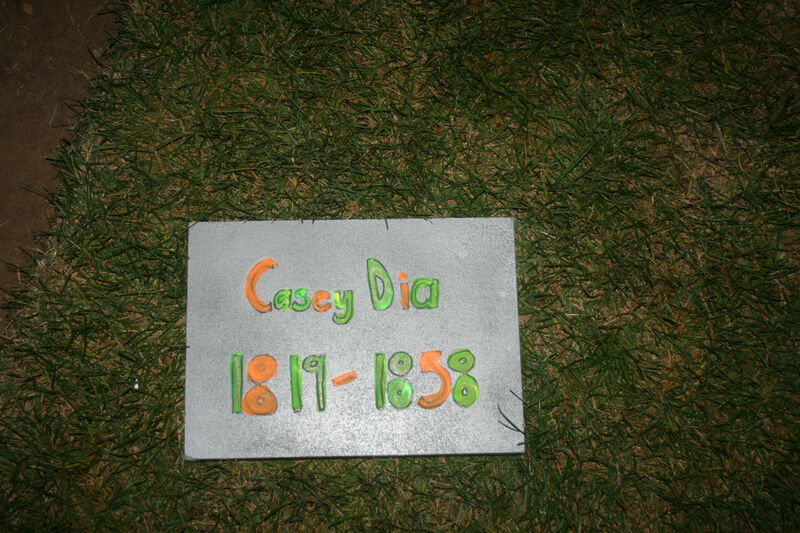 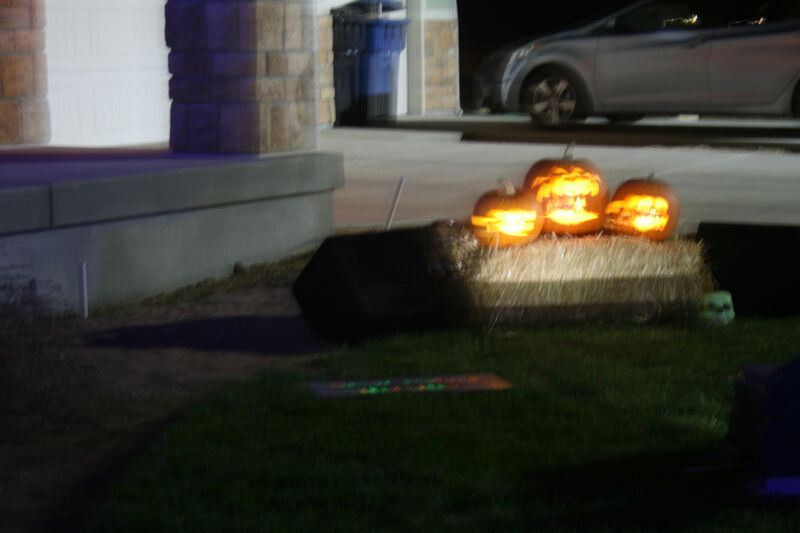 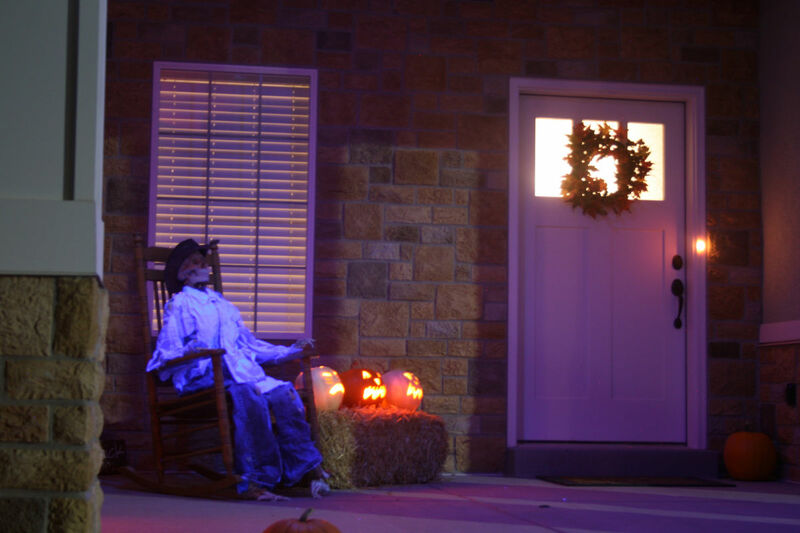 Luckily, the wind settled down enough to allow me to set the tombstones back up and put out most of the props. 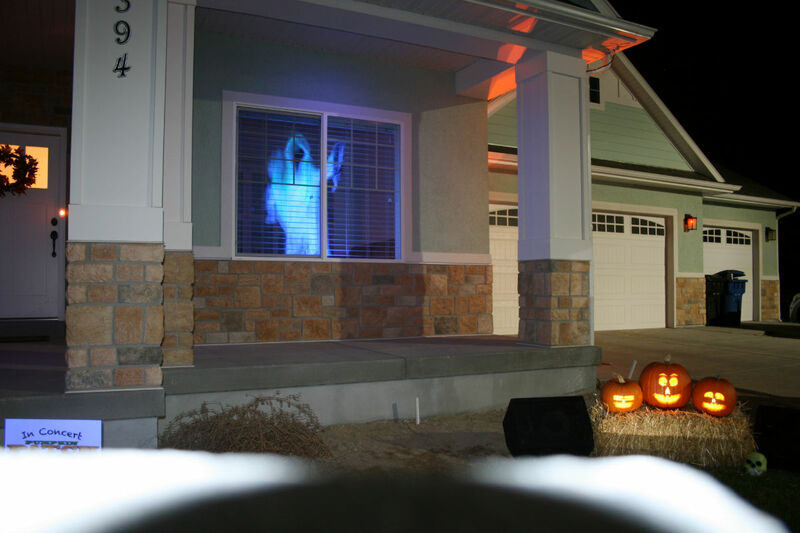 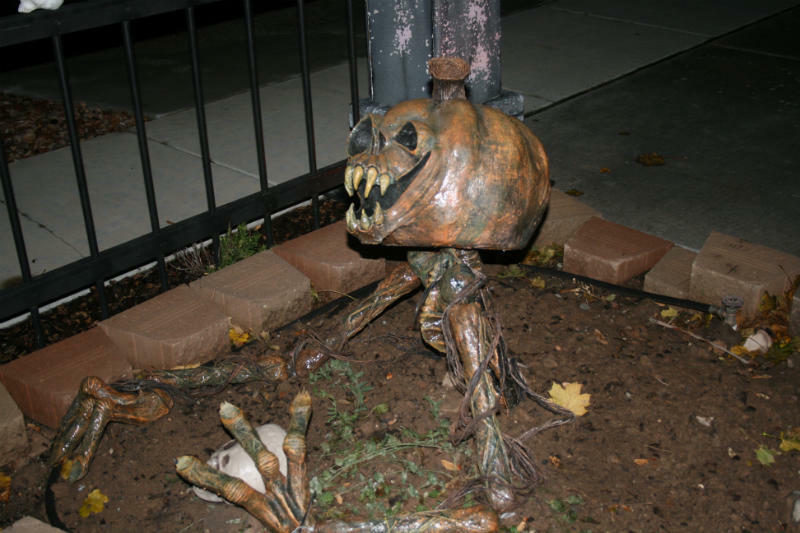 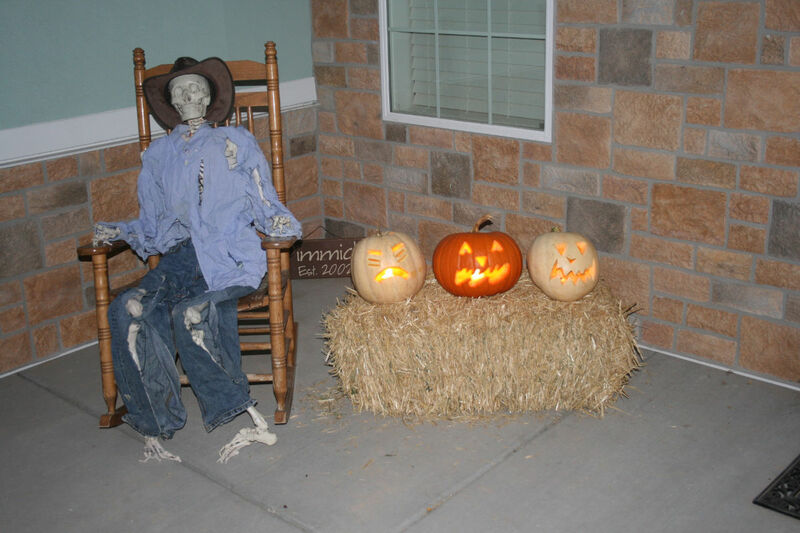 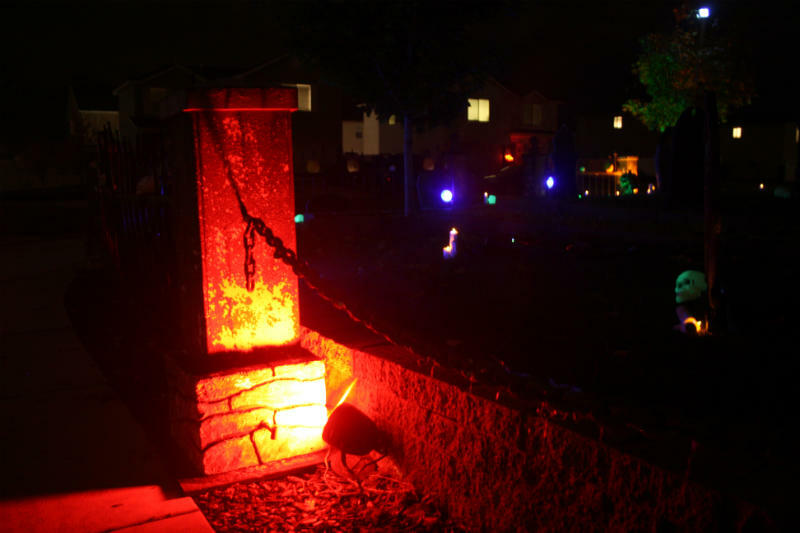 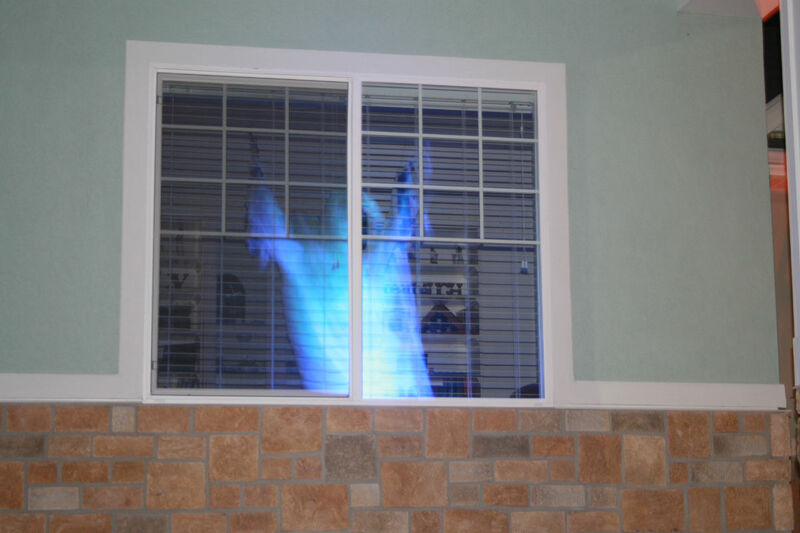 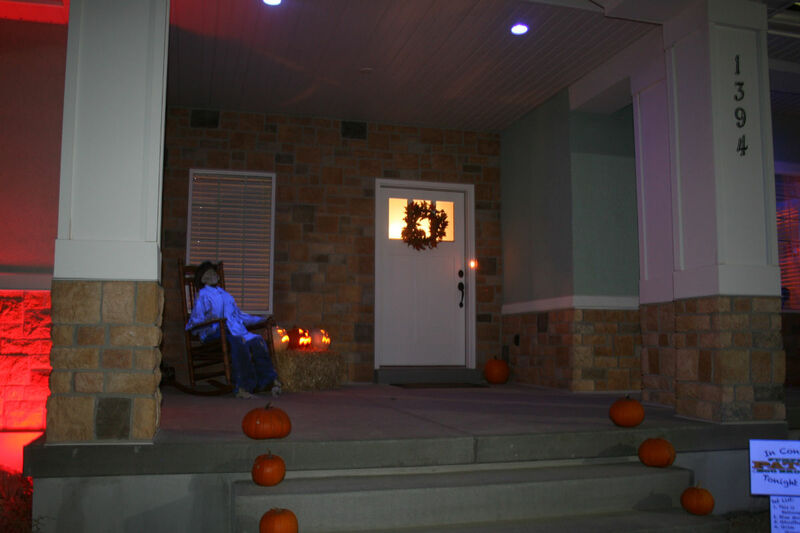 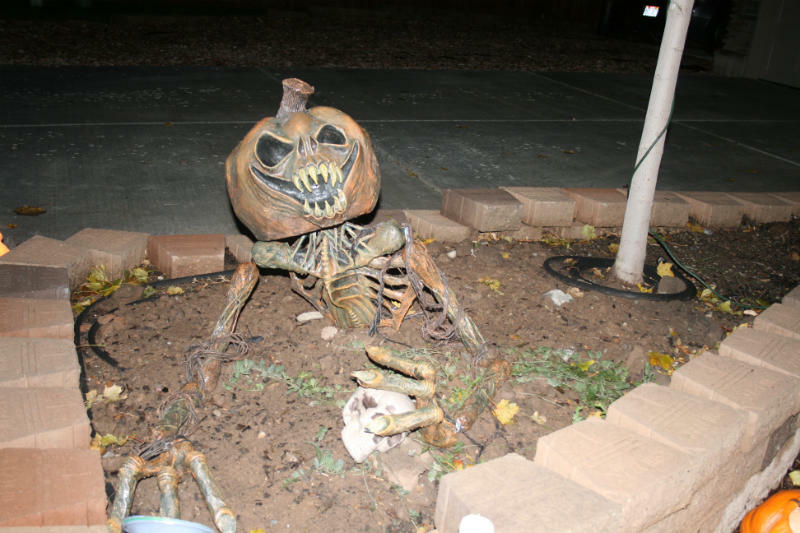 Gourdon Rotsworth made his debut appearance and the two ghosts were set up inside the house to greet the trick-or-treaters. 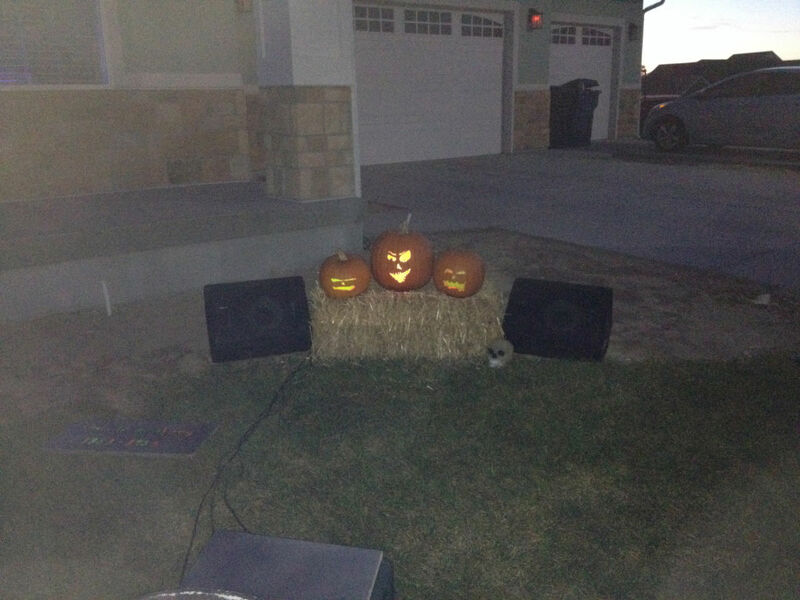 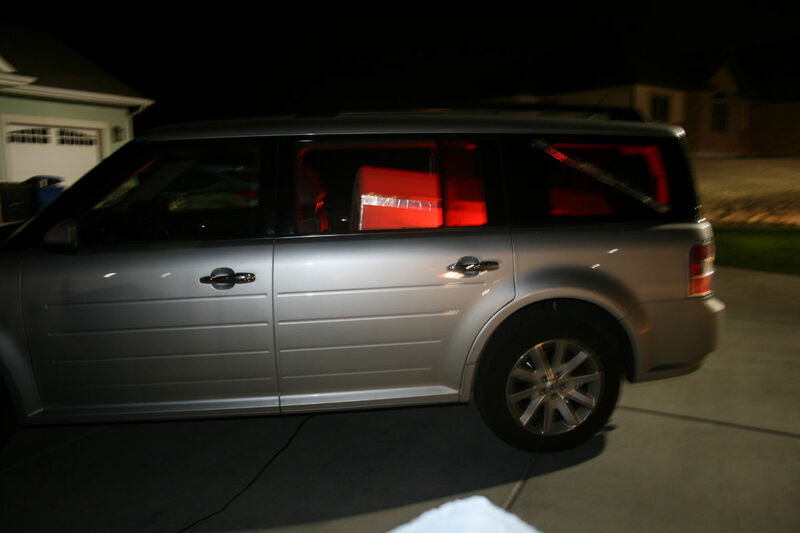 It ended up being fun and I was relieved that it was finally done at the end of the night. 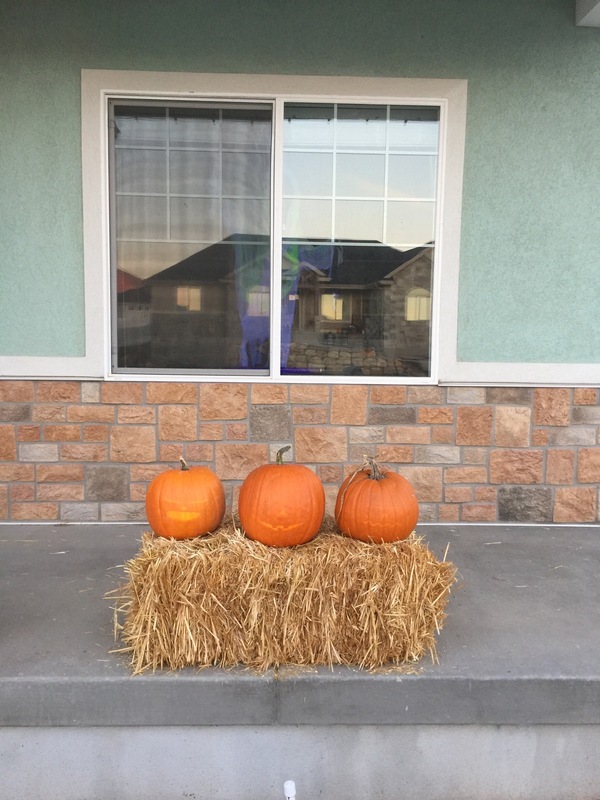 🙂 I have big plans for next year already. 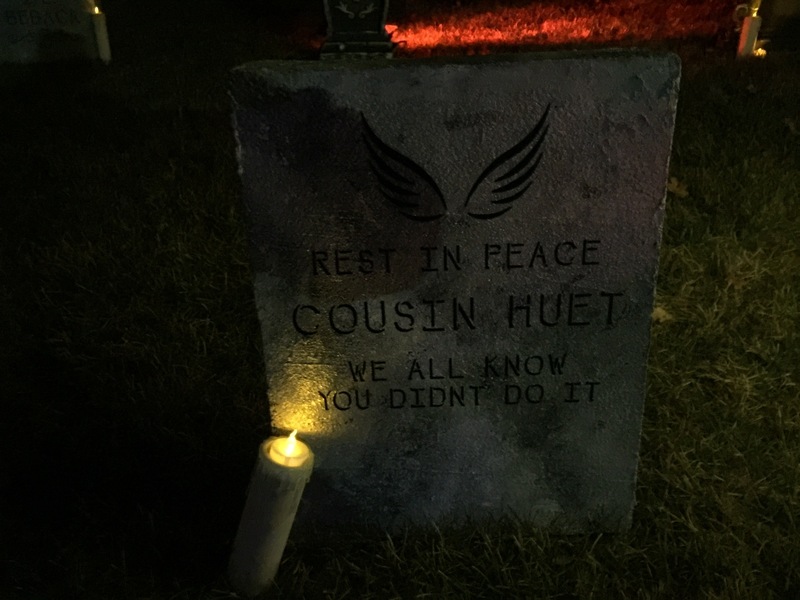 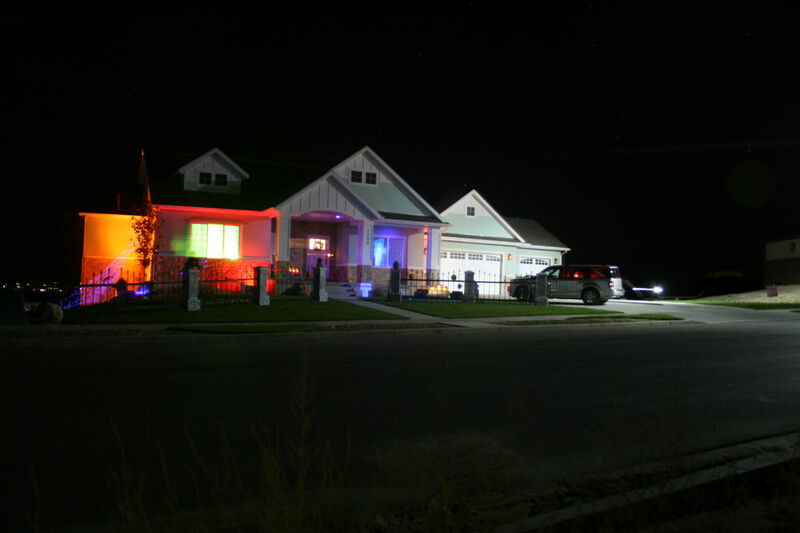 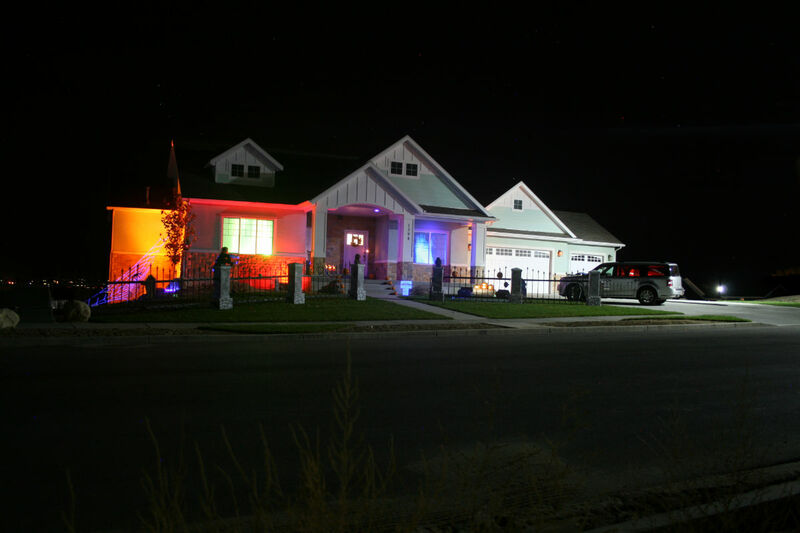 🙂 Enjoy this years haunt pictures. 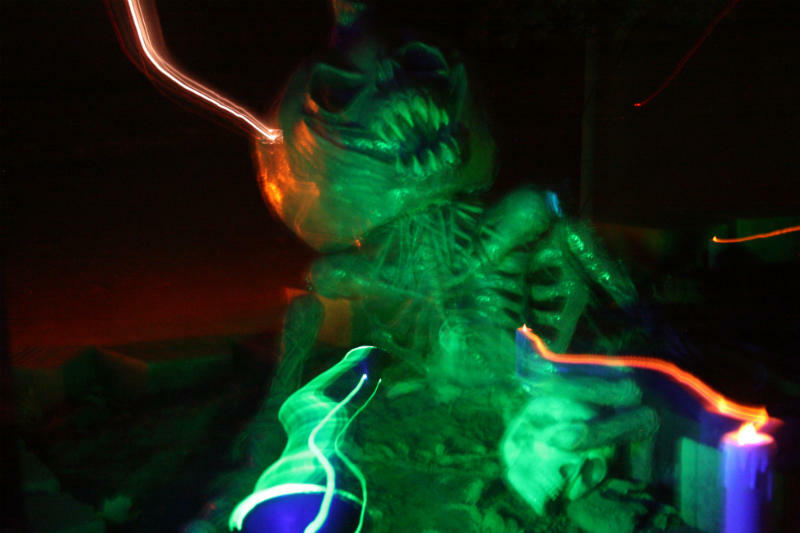 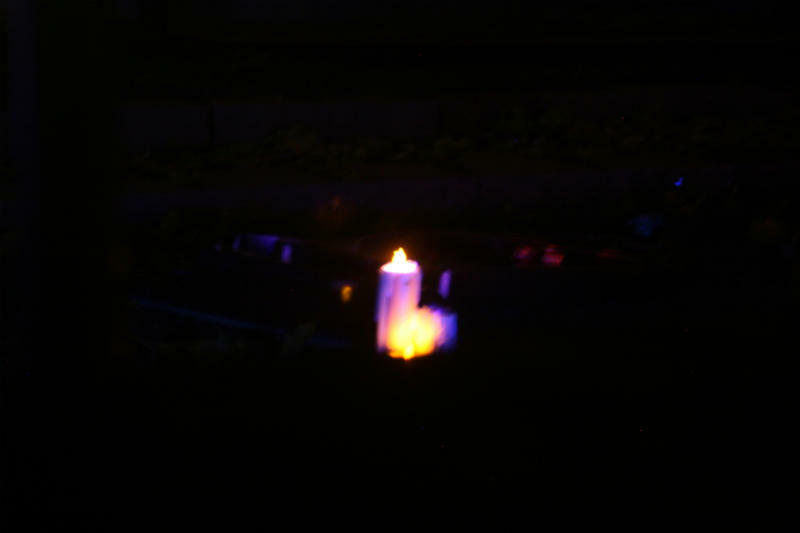 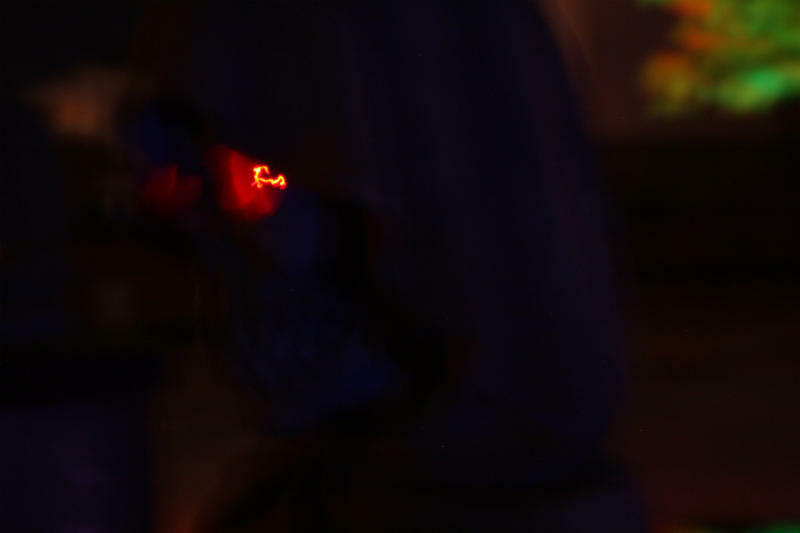 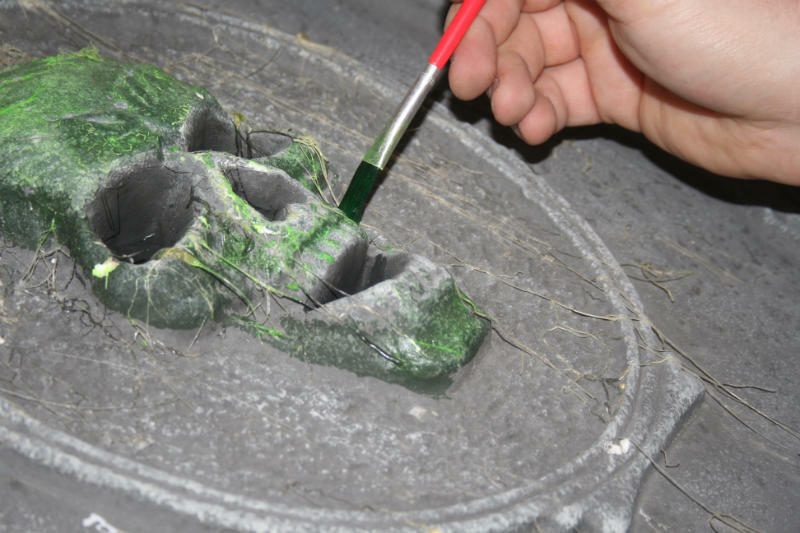 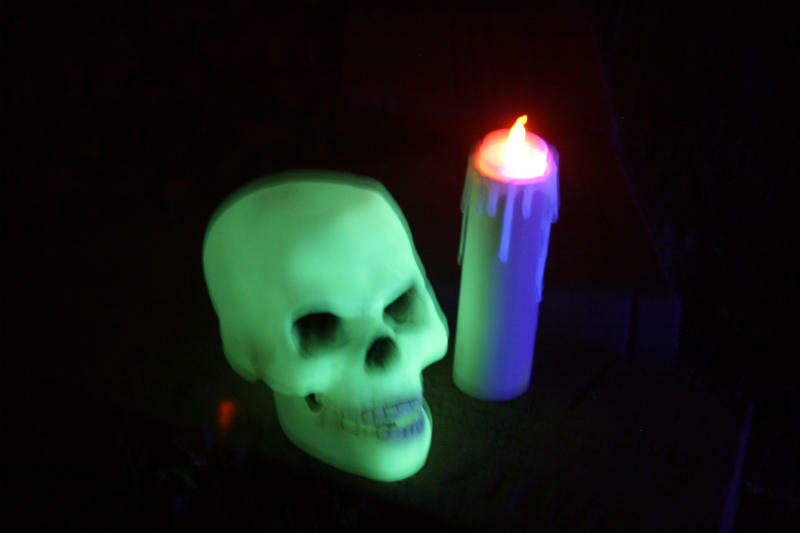 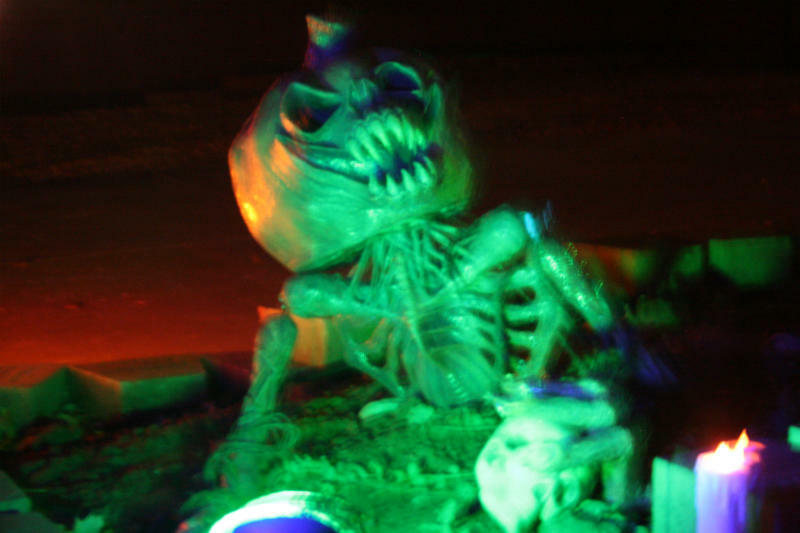 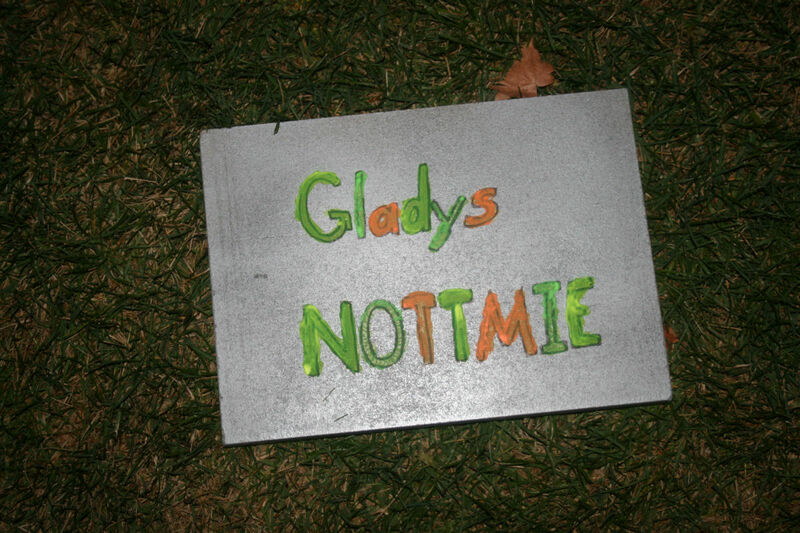 I wanted to make some of the details of my tombstones “pop” more under the black lights that I use in my haunt. 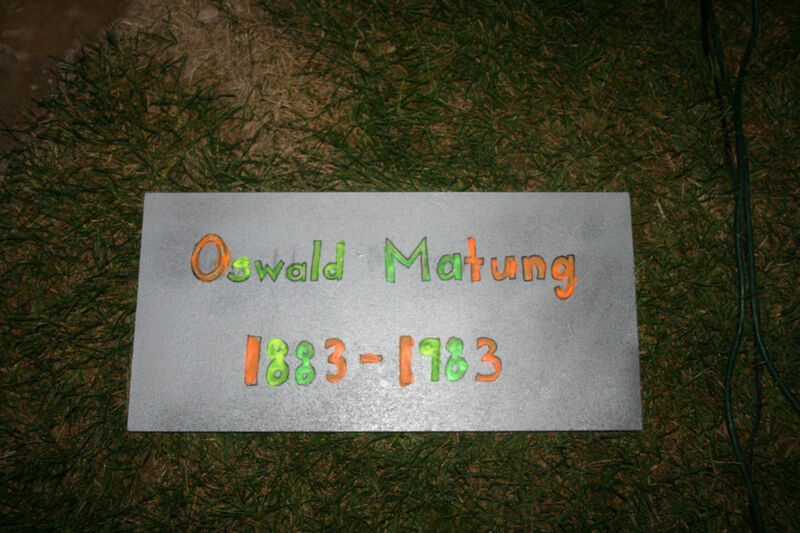 I opened a yellow highlighter and soaked the fluid-filled cotton stick with water to make a kind of paint to brush onto the tombstones. 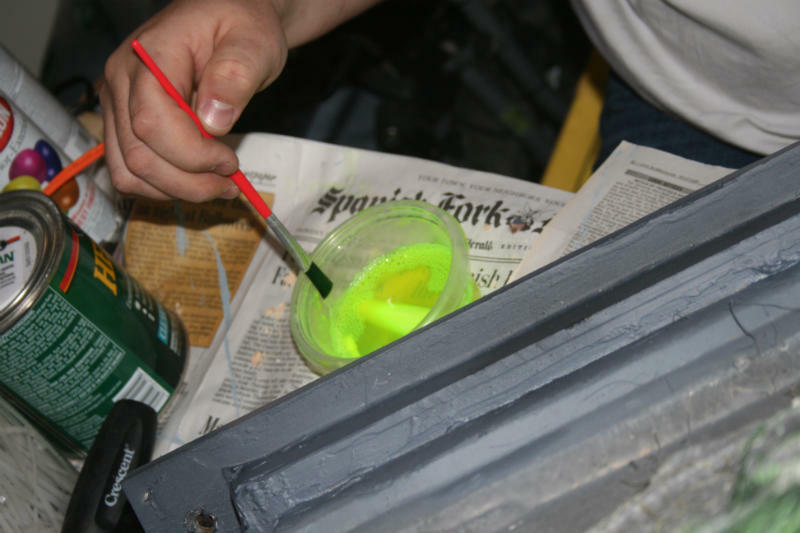 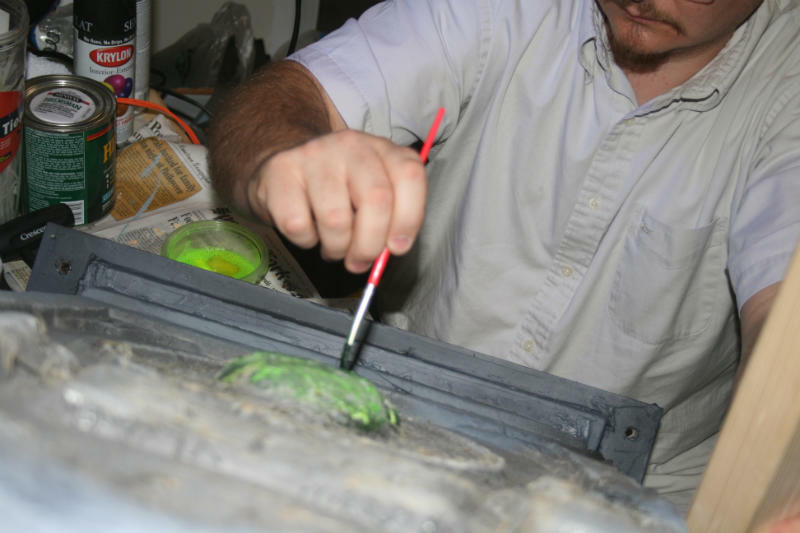 Once the highlighter fluid/ink was dry I hit those spots with a flat clear spray paint to seal it. 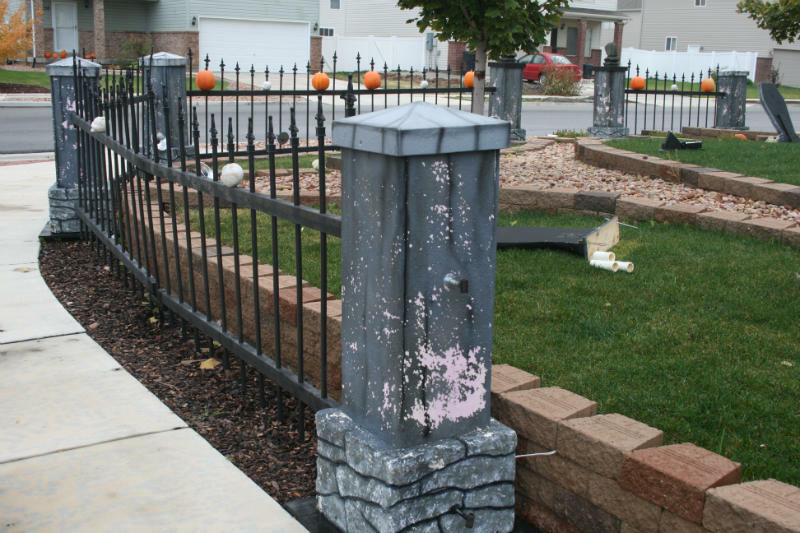 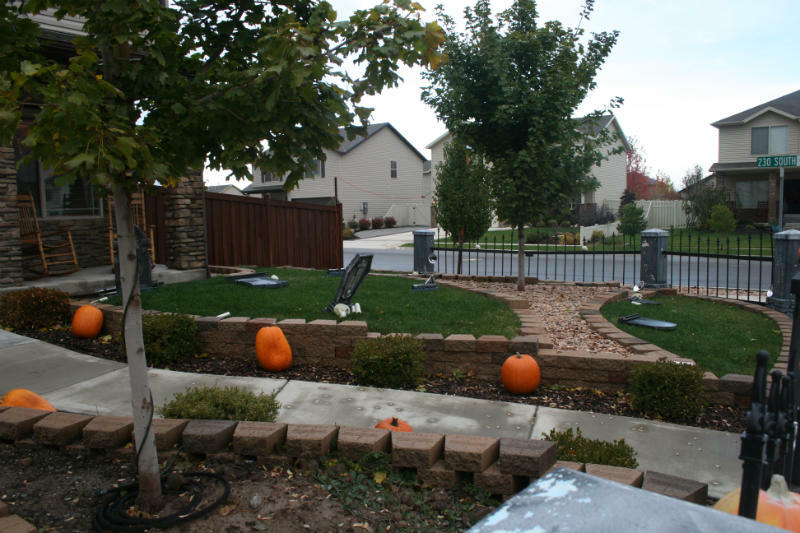 On Sunday, October 24th, there was a terrible storm that came through and damaged several of my tombstones and “power washed” a lot of the paint off of my fence columns. 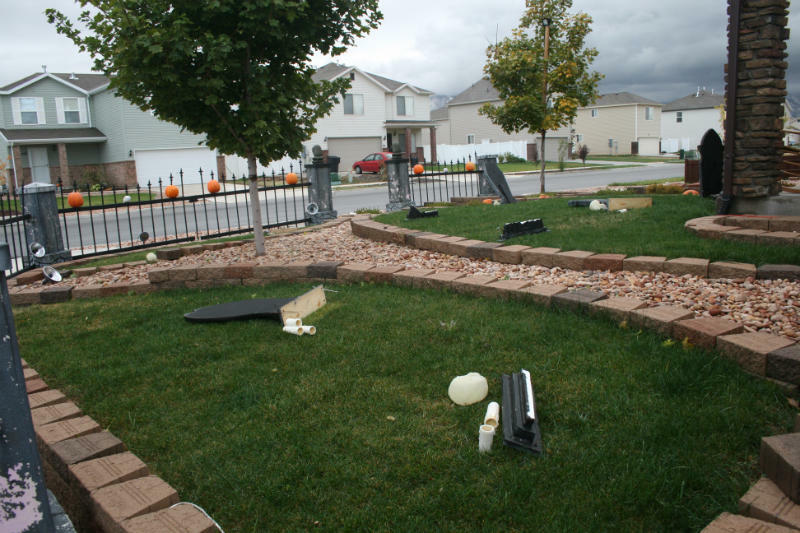 The wind and rain were fierce. 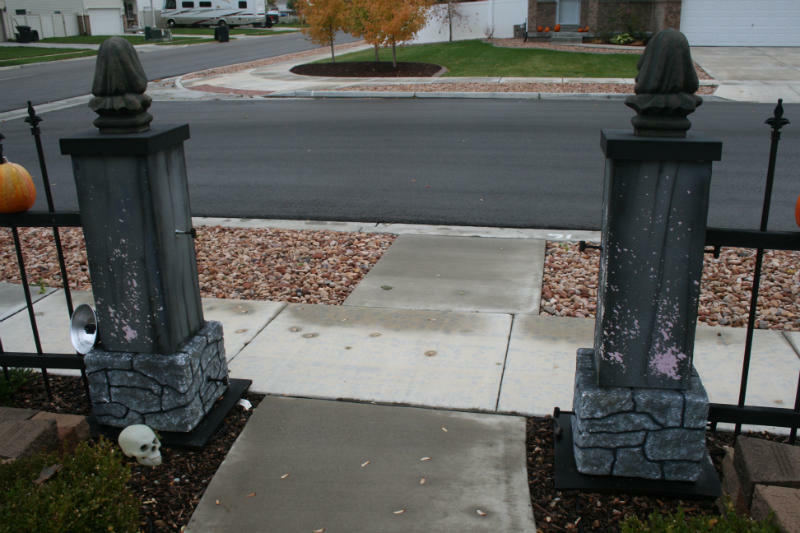 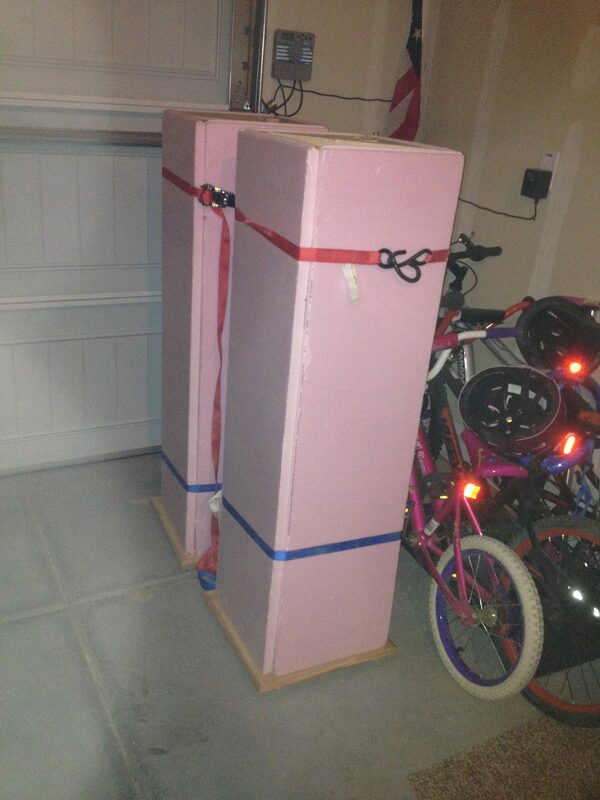 I was really frustrated and upset, but was relieved to find that an anonymous neighbor of mine found the missing tombstone pieces and returned them to my house. 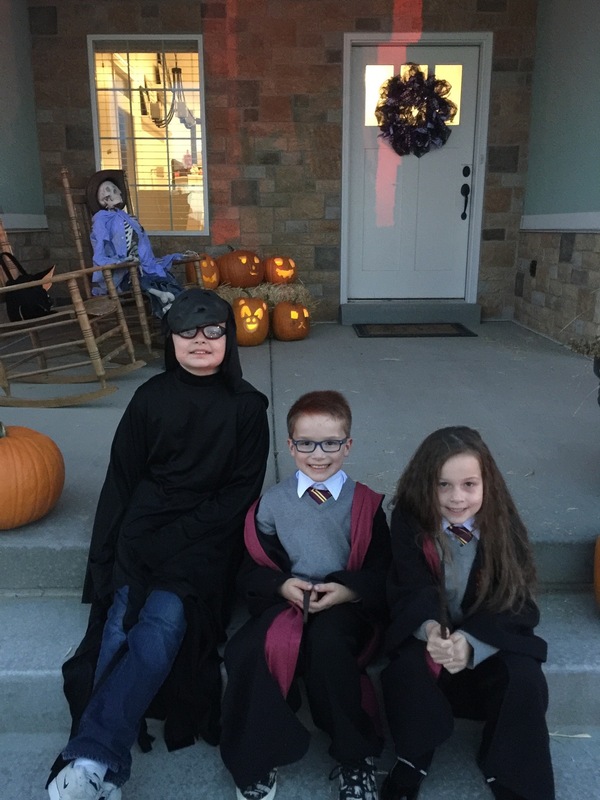 Thank you to whoever found them. 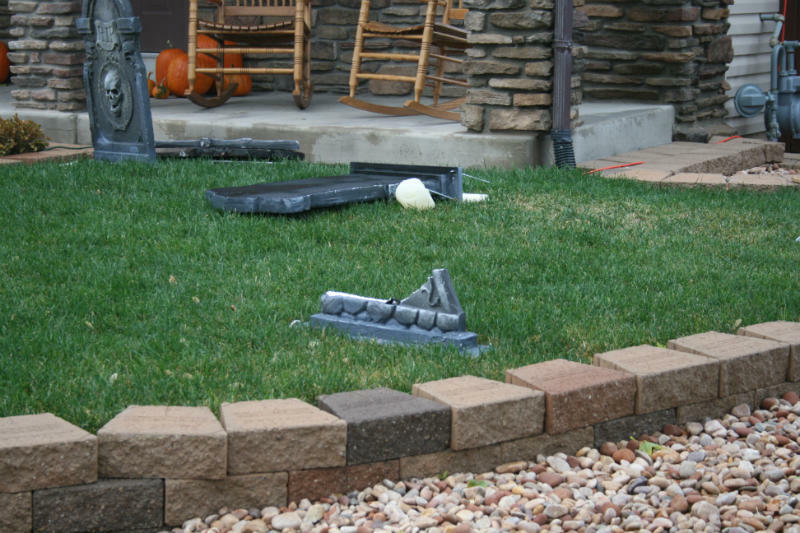 Here are some pictures of the aftermath of the storm. 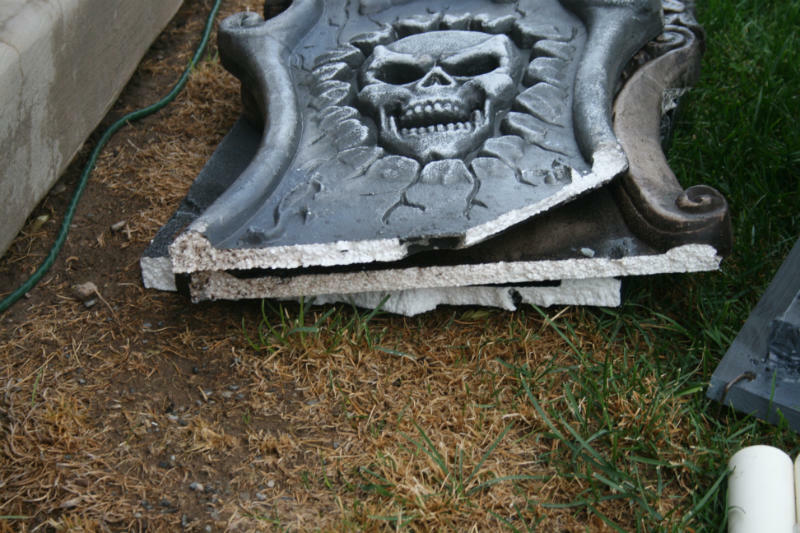 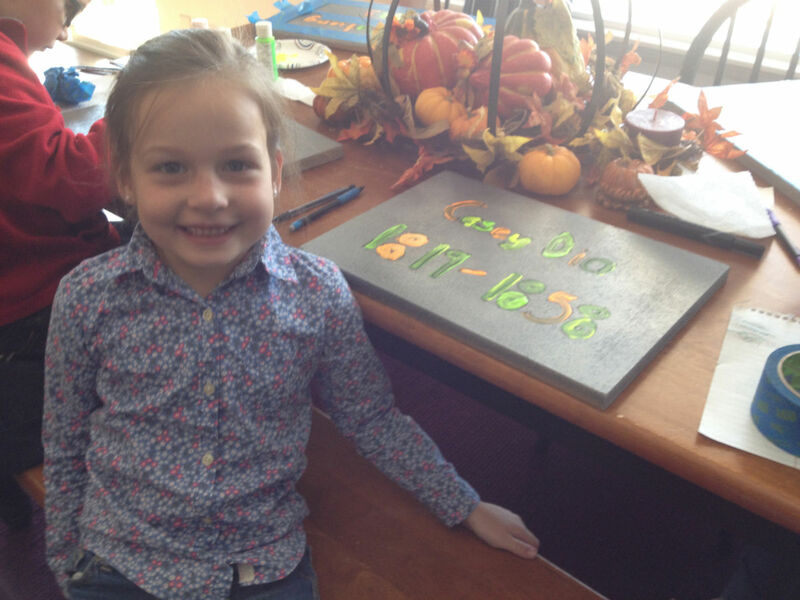 Spray painted with gray and black to try to match original colors. 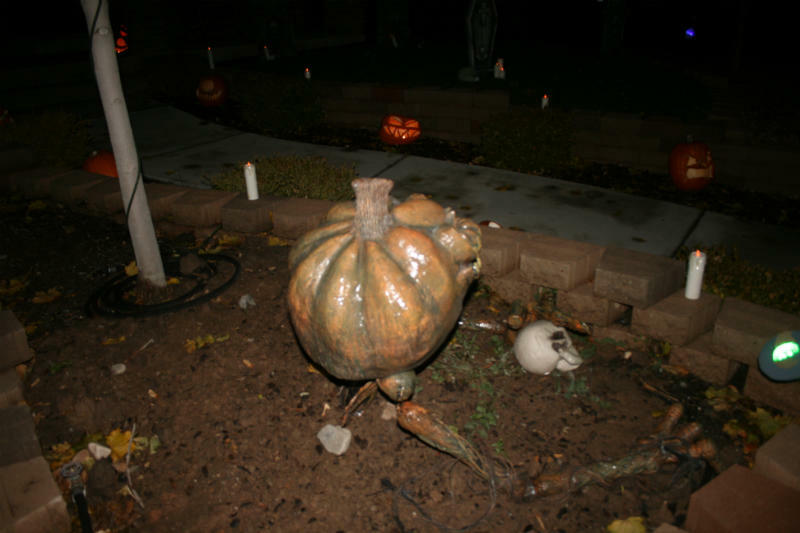 Holes are for staking to ground.